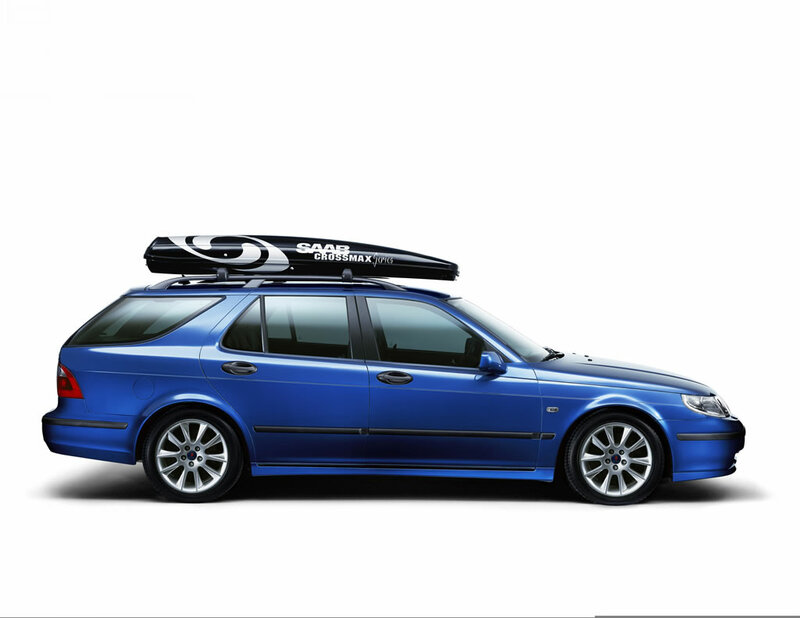 The Saab 9-5 sedan and wagon range is a clear expression of the sporty and multi-dynamic appeal of the Saab brand. Distinctively styled and beautifully built, it offers strong turbocharged performance and an outstanding combination of ride comfort and responsive handling, backed with class-leading levels of safety. Dual-zone automatic climate control (ACC); cabin air filter; cooled glove box; electrically-operated windows all-round; electrically-operated/heated door mirrors; Night Panel; Saab Information Display (SID); double sun visors; heat adsorbing glass; audio with single slot CD player; follow-me-home lights; split fold/lockable rear seat; height/reach adjustable steering wheel; ABS brakes; dual front, adaptive airbags; head/thorax side airbags (front); anti-whiplash front head restraints (SAHR); pre-tensioning/load limiting front seatbelts; triple three-point rear seatbelts; load-shifting protection; remote control/immobiliser. Arc specification includes the following additional features: Wood veneer fascia; leather upholstery and steering wheel; 16-inch alloy wheels. Vector specification includes the following additional features: Metallic finished fascia; sports textile/leather upholstery and steering wheel; 17-inch, 6-spoke alloy wheels; color-keyed bumpers and sill extensions. The specification of the 250 bhp Aero sporting flagship includes: unique sports bodystyling; full, two-tone sports leather upholstery and matte chrome door handles; 17-inch, 5-spoke alloy wheels; lowered sports chassis; traction control system (TCS); electronic stability program (ESP); trip computer; cruise control and front fog lamps. Factory-fitted options include: Five-speed automatic transmission with Saab Sentronic manual selection; TCS; ESP; leather upholstery; DVD-based satellite navigation system; electric glass sunroof; heated front/rear seats; electrically-adjustable front seats with driver’s memory; ventilated leather front seats; rain-sensitive wipers; parking assistance; electrically-folding door mirrors; auto-dimming rear-view mirror; bi-xenon headlamps; anti-theft alarm; child seats; body levelling; 17” alloy wheels; walnut fascia. Standard equipment specifications can vary between different markets. Please check information with your importer. 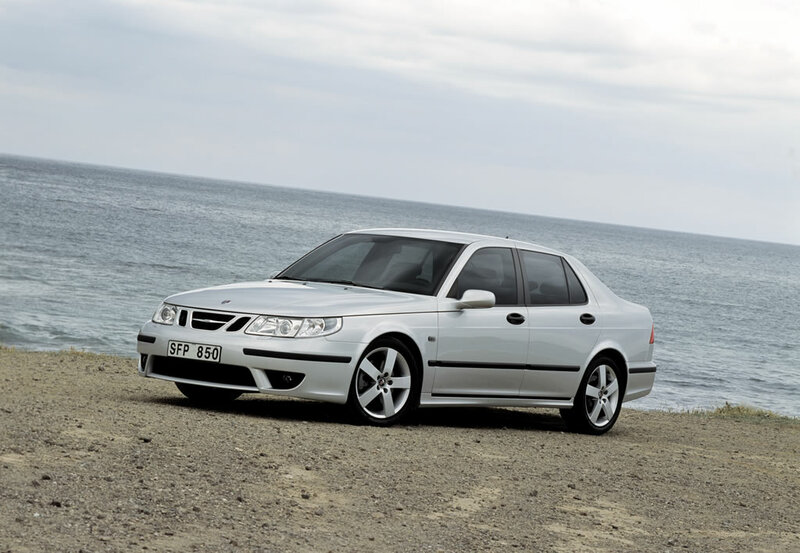 The strong and sporty character of the 9-5’s exterior design immediately identifies it as a Saab. 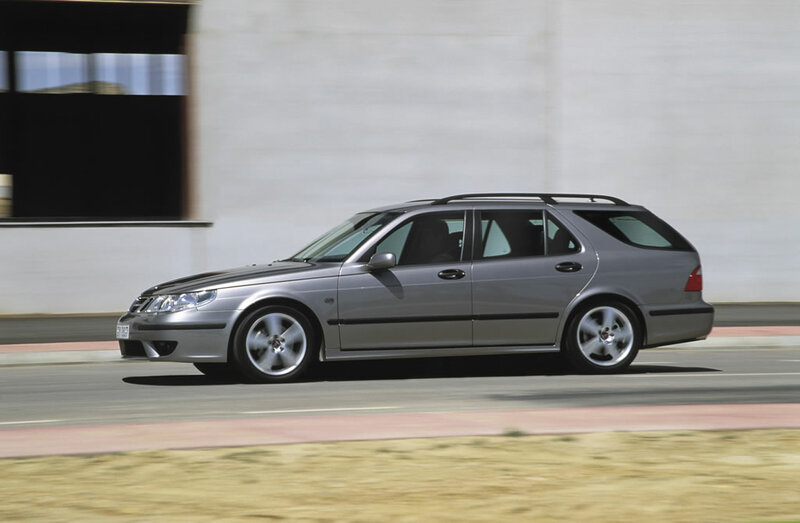 Whilst the sedan and wagon models share the same frontal styling, they were developed as separate, parallel projects and have their own identities. The range exudes a robust, sporty character, reflecting its all-turbo powertrain, with a greater emphasis on multi-dynamic qualities for the wagon. It is positioned towards the top of the European large car segment with a wheelbase of 2703 mm and an overall length of 4827 and 4828 mm, respectively for the sedan and wagon. In its frontal appearance, the new Saab 9-5 looks wide and low with the grille, headlamps and bumper flowing smoothly together. The shape of the headlamps and side indicator lenses and the adoption of a ‘clamshell’ hood design, echo design details from earlier Saab models. 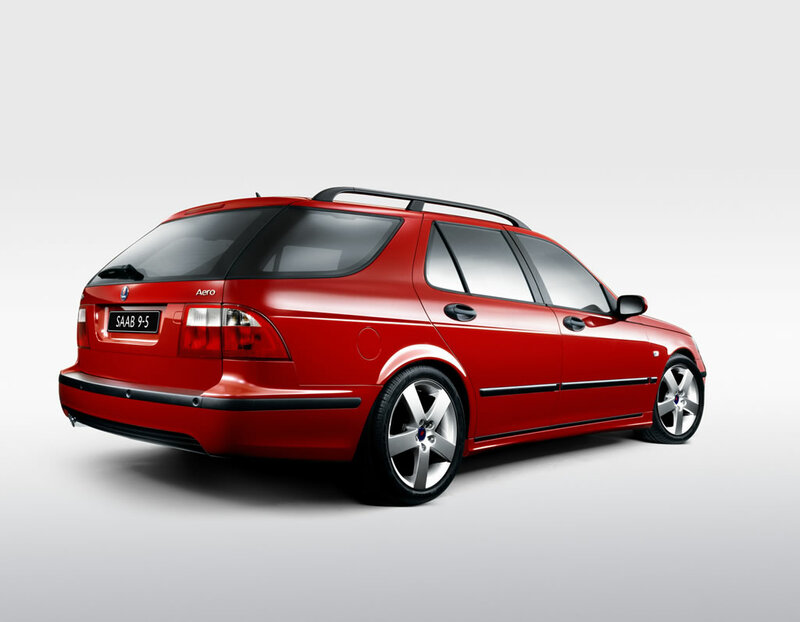 In side elevation, the body and window lines rise upwards to create a typically-Saab, wedge-like profile, including the ‘teardrop’ shape of the side windows. 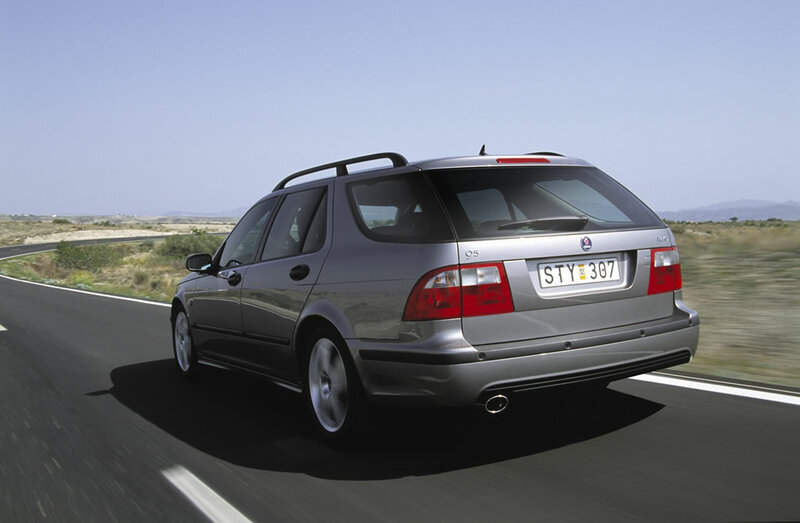 The curvature of the ‘C’ pillar, which is also a prominent feature in the wagon, is another key Saab identifier. 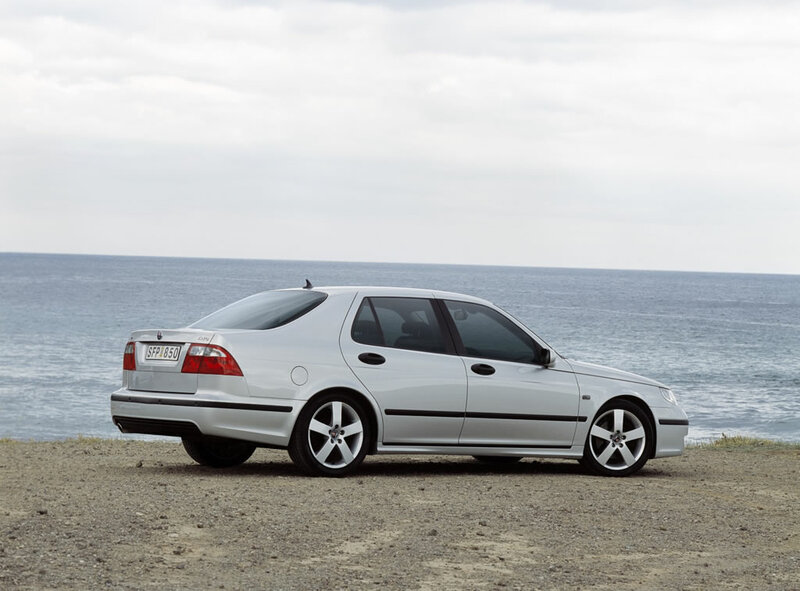 At the rear, the ‘D’ shape of the sedan’s back window is again reminiscent of earlier Saab designs. 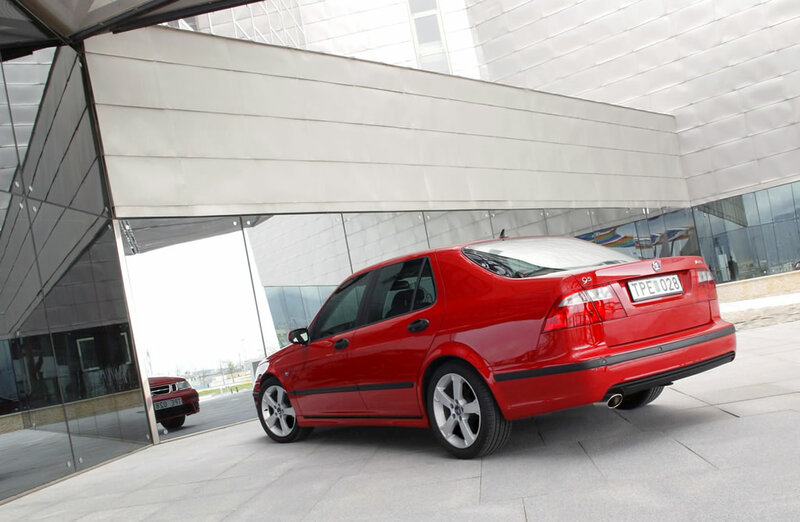 The boot lid, with a subtle rear lip, is relatively short but high enough to prevent the airflow detaching too early, reducing drag and increasing the height of the luggage compartment. 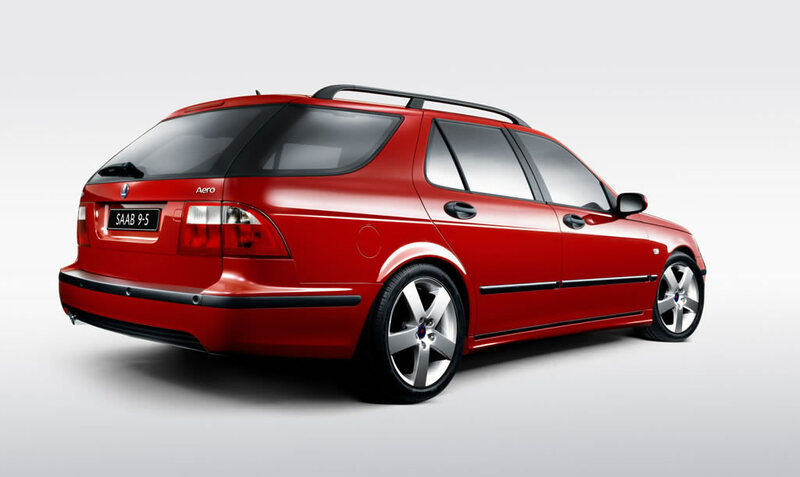 The ‘cut out’ shape of the rear light clusters is another classic Saab styling cue. 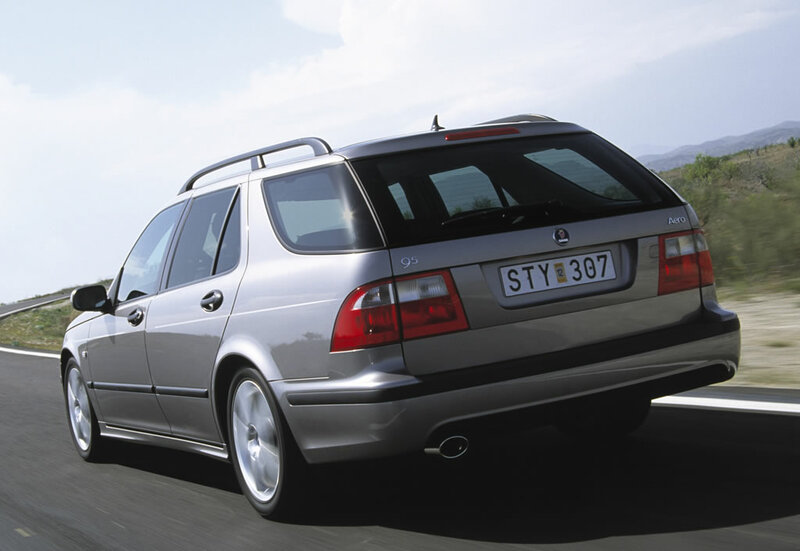 To emphasis its sporty character, the wagon adopts a markedly raked rear window. And to break up the length of the car and to give it a strong waistline, the prominence of the ‘C’ pillar is further emphasised by the distinctive ‘wraparound’ rear window, which appears to merge with the side windows by concealing the ‘D’ pillars. “To do justice to the fine qualities of the chassis, it was essential to move away from the traditional box-like shape of a load-carrier,” explains Padian. 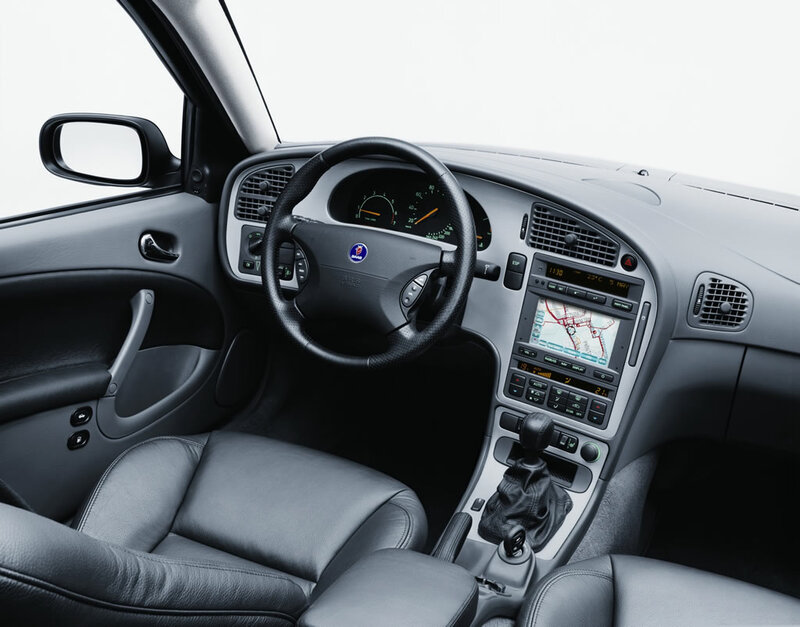 The spacious interior of the new Saab 9-5 has been designed to give the driver a feeling of being totally in command and to offer passengers exceptional standards of comfort. 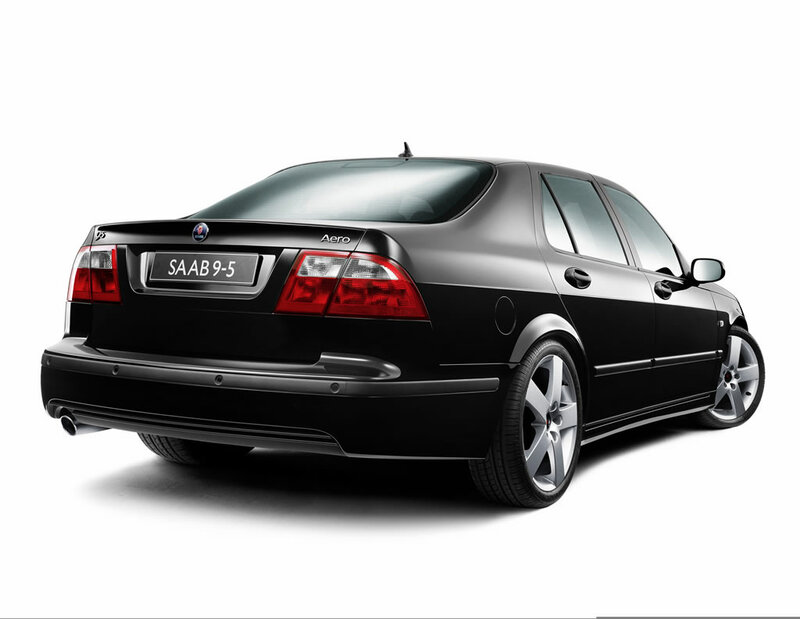 The soft curves and fluid ‘organic’ shapes complement the exterior styling and the overall effect is very different from the relatively cold and clinical interior design themes adopted by Saab’s premium class competitors. The cockpit-like main instrument console curves around driver and downwards towards the ignition key, handbrake and electric window controls. The scalloped door panels and sweeping curves of the interior upholstery echo the shape of the fascia. The low-level cinema style interior lighting creates a warm and welcoming atmosphere. The quality of materials and their fit and finish is everything you would expect in a car of this class. 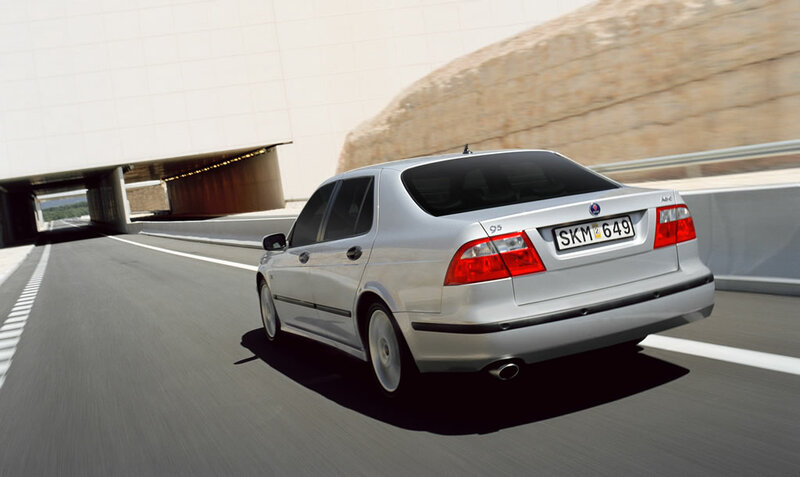 The tactile satisfaction in simply operating the controls and the great attention to detail – as evidenced by the superbly designed fascia air vents – follows a fine Saab tradition. To produce an adaptable and comfortable driving position, the interior designers started from a single fixed point of reference – the heel of the right foot. Numerous computer simulations then developed the most natural and comfortable operating arcs and reach zones for different-sized driver, in combination with all possible seat locations and positions for the steering wheel, which adjusts for reach and height. All controls are black, except the door release levers, which are chrome so that they are easier to find in the dark. Most of the other controls are illuminated and identified by easily-understood graphic symbols. The layout of the instruments and controls is straightforward and logical. Those most commonly used are nearest the driver to view or operate. All dials are white on black and green instrument illumination is preferred at night as this is more restful for the driver. The ignition switch is mounted just where you would expect to find it in a Saab – down between the front seats alongside the handbrake. It is located there for good reason: it cannot damage the driver’s knee in the event of a heavy crash; it makes good ergonomic sense because the handbrake is nearby and it also serves as a reverse gear lock for additional security. 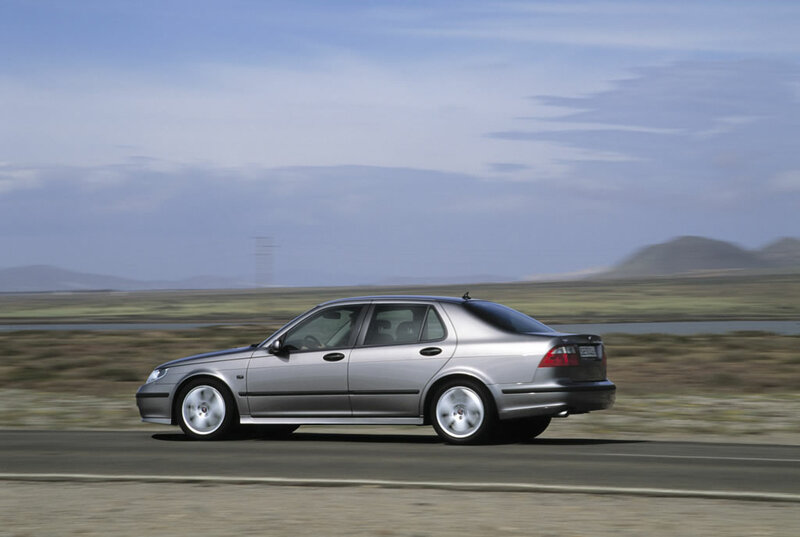 Saab cars are widely-acclaimed for their supportive and comfortable seats and the 9-5 follows this tradition. The front seat structure provides good back and under thigh support for long journeys, as well as high levels of crash protection. 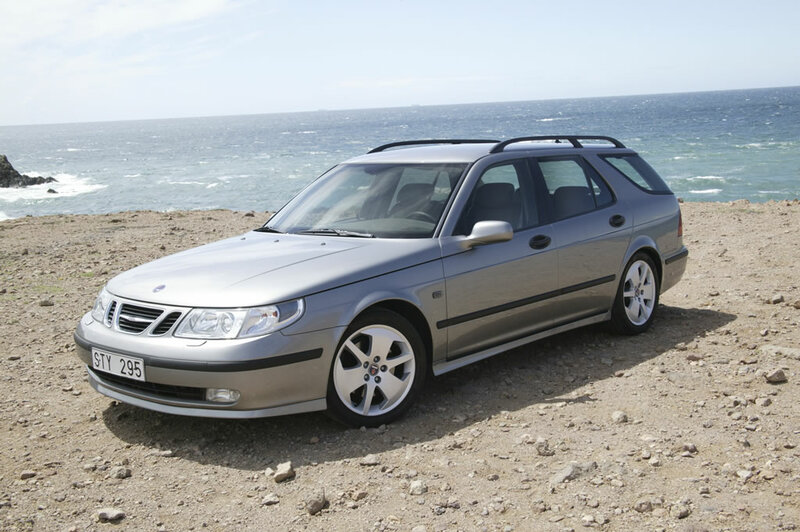 Seating comfort is one of the main reasons why Saab cars have earned a reputation among drivers as superb long distance tourers. The padding is soft enough for good comfort, but firm enough to support occupants securely. Extremely high quality trim materials, a textile fabric weave or leather, are used to combine comfort with long-term wear resistance. Electrical heating is available for rear as well as front seat occupants. he driver’s seat has a wide range of adjustments for reach, height and back-rest rake. Electrically-operated adjustment is also available for both front seats, with three memories that record all the adjustments chosen for the driver’s seat, including the door mirror settings. This is a useful feature when more than one person regularly drives the same car. The front seats are also fitted with Saab Active Head Restraints (SAHR), a unique Saab-developed safety feature that automatically reduces the risk of neck injury in a severe rear-end crash (see Safety Section). 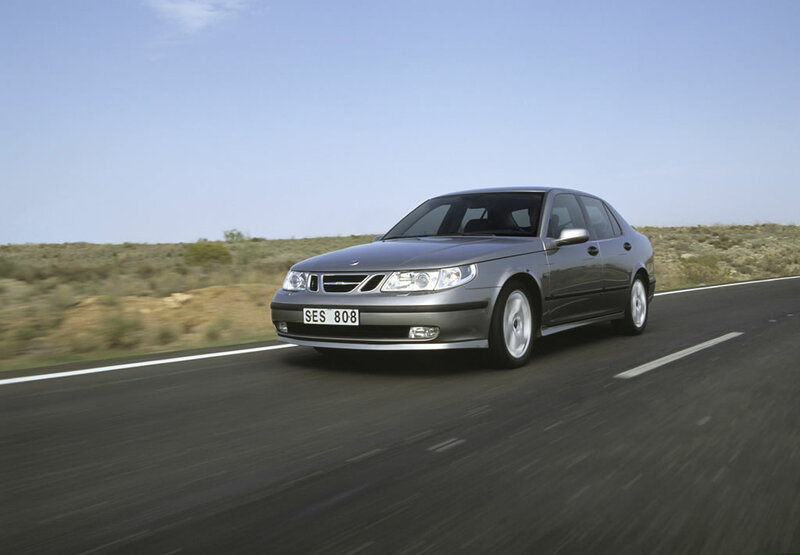 The new Saab 9-5 benefits from extremely low interior noise levels. This has been achieved through the excellent aerodynamic properties of the body, its fine structural properties and the scientific application of sound deadening materials and special door seals. Almost all the unwanted noise, vibration and harshness is attenuated by the design of the engine and suspension mounts, while the turbocharger fitted to all engines helps reduce exhaust noise. Porous sound absorbent pads are applied to the engine compartment bulkhead, hood, floor and wheel housings before the body is painted. Extra sound insulating materials are also applied to all sheet-metal surfaces that might be susceptible to vibration. To minimise road and wind noise, as perceived by those inside, triple rubber seals are fitted to the upper door frames and double seals lower down. All are tubular in section to ensure they work consistently, irrespective of any differences in air pressure inside or outside of the car. In the interests of cabin refinement, a great deal of attention was devoted to the installation of the sub-frames and the engine mounting system. 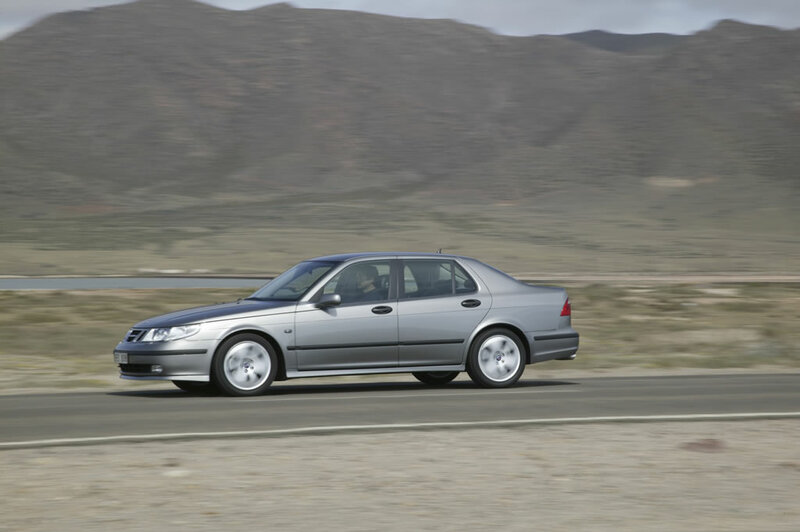 The Saab 9-5 is the first Saab to use a torque-roll axis engine installation where the vertical loads of the powertrain assembly are separated from the torque reactions. An additional tuned rubber-in-metal mass damper is also installed in the steering wheel assembly to absorb vibrations when the engine is at idle. The wagon is designed to offer occupants the same level of comfort as the sedan, despite the open load area behind the rear seats, which in some cars is prone to resonance or ‘booming’. This has been achieved by careful attenuation of noise and vibration at the rear, as well as the use of a substantial, foldable rear parcel shelf, which was preferred to the more common, but far less effective, ‘roller blind’ partitions. There is a choice of three interior specification levels, or ‘forms’: Linear, Arc and Vector. The terms are drawn from the world of architecture and each ‘form’ creates its own distinctive ambience or atmosphere, reflecting a typically Scandinavian flair for simple yet elegant design. These forms are available in a ‘light room’ theme, with sand beige upholstery and carpet, or as a ‘dark room’, with zinc gray furnishings. 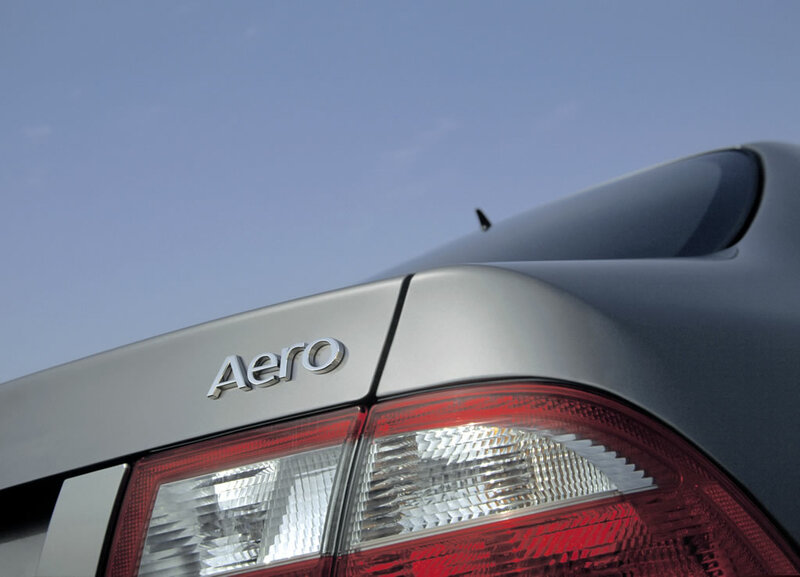 The Aero designation is reserved strictly for the 250 bhp sporting flagship of the range, in sedan or wagon format. Linear, a straight line or base element in architecture, communicates simple, understated functionality and is probably closest to the design essence of Saab. The fabric upholstery features contrasting weaves, with thicker material for the seat cushions, and the fascia is presented in a natural black, anthracite color. Arc is a modern interpretation of classic design and adopts a natural leather theme for the seats and door panels, with a light burr walnut veneer fascia insert. Externally, it is distinguished by the addition of 16-inch, 5 spoke alloy wheels. Vector is more progressive, reflecting a sportier, more performance-orientated ethos. The interior leather upholstery features deeply bolstered, sports front seats in cloth/leather and the fascia is finished in aluminum. Externally, the sporty, high-tech look is complemented by a deeper front air dam, extended side sills and larger, 17-inch, 6- spoke alloy wheels. 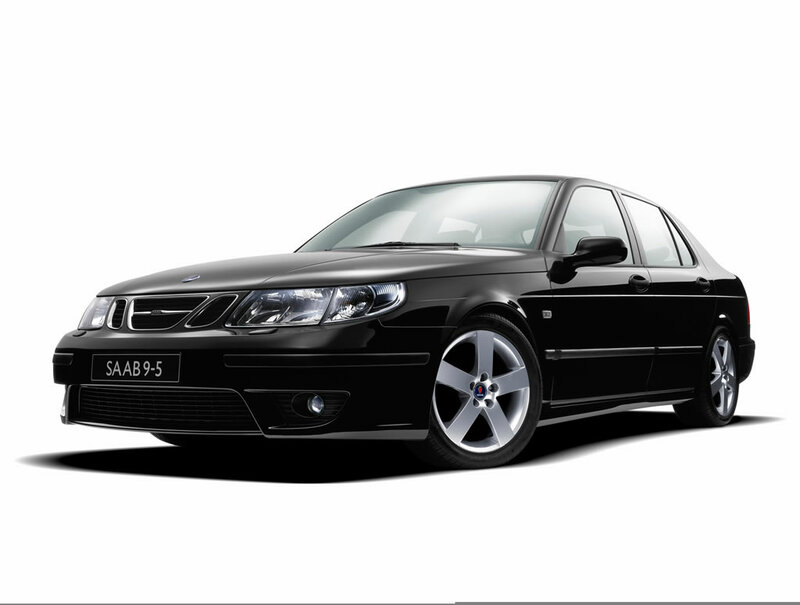 The ultimate expression of Saab turbocharged performance is the 250 bhp Aero model. It shares the same sports seats as the Vector, but upholstered throughout in two-tone leather. Externally, it has distinctive sports bodystyling; 17-inch, 5-spoke alloy wheels inspired by the 9X concept car and a chassis lowered by 10 mm. A stainless steel exhaust and ‘Aero’ badging on the trunk lid completes the look. The teardrop-shaped first Saab 92, revealed more than 50 years ago, had a Cd value of only 0.31 but required partially covered front and rear wheel housings to achieve it and was powered by a small engine with minimal cooling requirements. 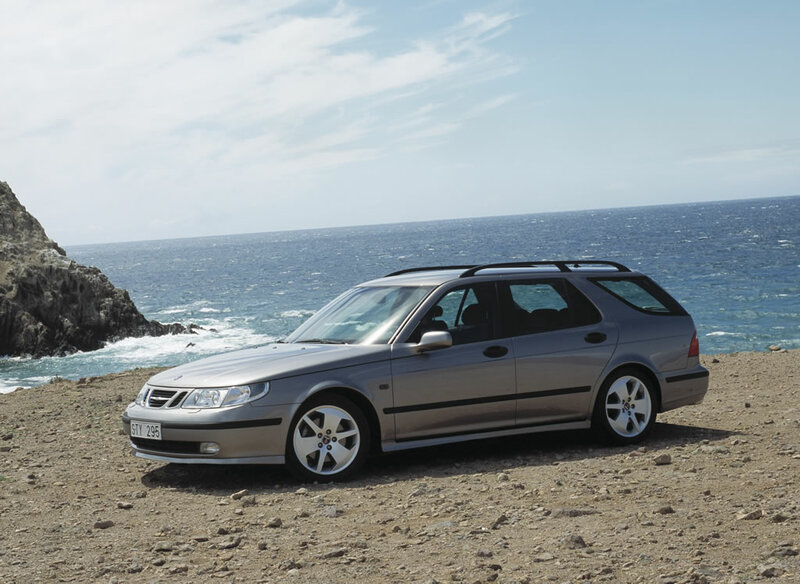 The Saab 9-5 sedan and wagon each has a highly competitive Cd of only 0.29 and 0.32 respectively, even though they are much larger vehicles. The aerodynamic development of the new 9-5 range was such a high priority that the process started with discussions about body shapes and styling details as soon as the first sketches of the design proposals had been drawn. A number of one-fifth scale models were built in the design studios and taken to the wind tunnel at Stuttgart University for concept testing. The results of these preliminary investigations were then fed back to the design team, so they could continue finalising the shape and design details of the new car from a sound technical base. Unusually for the automotive industry, these early clay models incorporated a fully detailed underbody. “Taking the trouble to model the floorpan and suspension components meant the initial aerodynamic values were much closer to those we measured later on full-scale cars,” says Håkan Danielsson, head of aerodynamic development at Saab. This air flow work focused on the breakaway points, where the turbulent wake or localised eddies leave the body surface, which are very important in allowing the designer to optimise features like the windshield angle, the height of the rear trunk lid or the shape of the tailgate, as well as determining the most efficient basic form. The models were then rotated by up to 30 degrees to the direction of the air flow, to reproduce the effects of cross winds. “It is essential for us to know the lift forces front and rear under these conditions because we must provide stability in cross winds as well as in still air,” adds Danielsson. This model was then taken to the Motor Industry Research Association’s closed-section wind tunnel in the UK for the further development of functional features like door mirrors, spoilers, mud flaps and noise shields and to obtain the first real values for drag and lift coefficients. The 9-5 generates progressively less drag as more air is allowed to flow under the floor. “We utilised shields under the engine compartment to maintain attached flow in this area,” explains Håkan, “but we found it better to provide air dams instead of shields at the sides underneath the front bumper.” A flat plate about 100 mm long was added under the rear bumper so the flow is reattached before it breaks off into the rear wake, reducing contamination of the rear end. 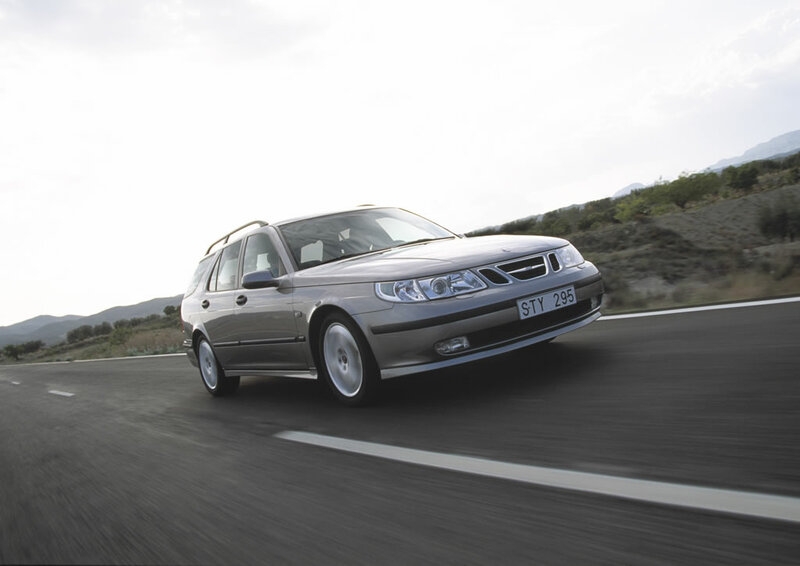 Saab engineers have regarded occupant safety as a vital feature since the first Saab cars were designed in the 1940s. The primary goal is to avoid getting involved in a road accident, known as driving – or active – safety. A high level of driving safety ensures the driver’s environment is conducive to allowing full control and that the vehicle’s handling is highly responsive and predictable. The driver’s environment within the car is becoming increasingly congested. Research shows there are now more than 100 functions requiring manual control from the driver and more than 150 information inputs being given out. Increasing traffic densities also adds further to an already heavy workload for the driver. 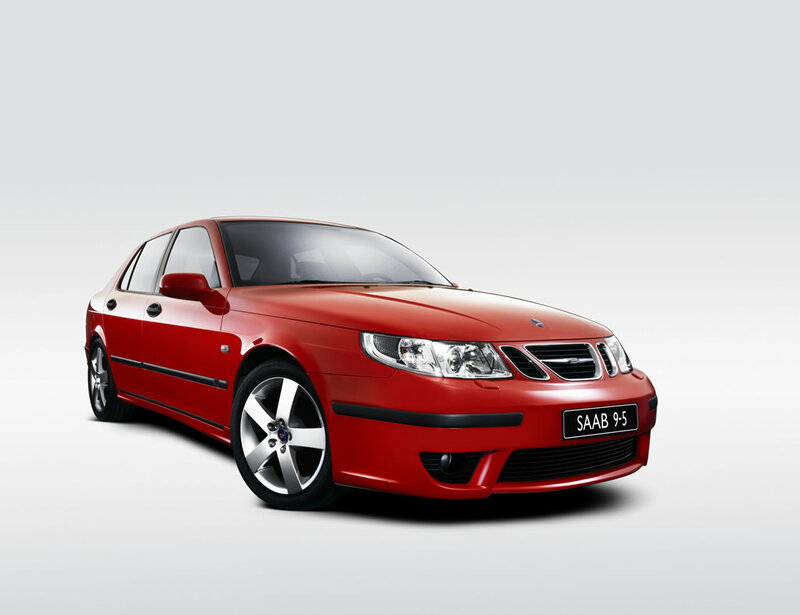 To make life easier, the instruments and controls of the Saab 9-5 are logically arranged, according to functionality and frequency of use. And to reduce the risk of distraction for the driver at night, Saab first developed the ‘Black Panel’ instrument display and this feature is enhanced on the 9-5 as ‘Night Panel’. (see Comfort and Convenience section). A clean interior air supply makes for a clear head and this is another facet of driver control that receives a high priority. All specifications have a combined electrostatically-charged pollen and gas and odour absorbing charcoal filter. The dual zone, automatic climate control, another standard feature, allows the driver to select a temperature setting inside the car independent from the passengers. 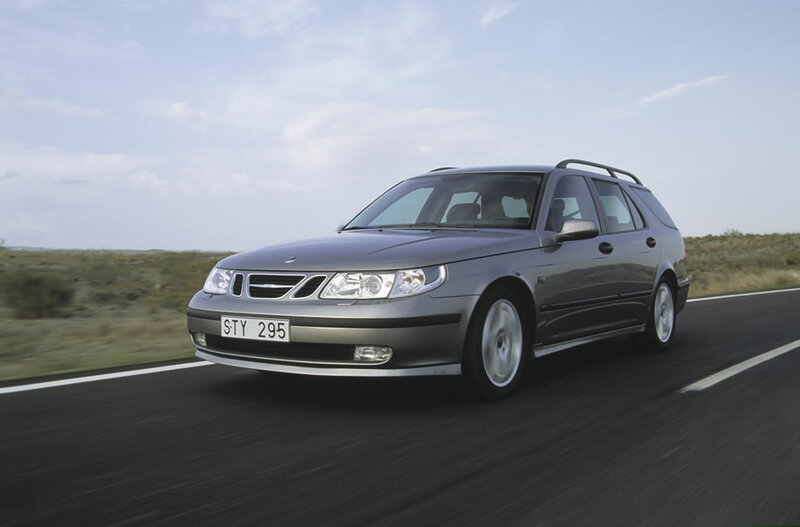 For secure handling, the 9-5 follows Saab tradition in being front wheel drive and providing consistent and very ‘forgiving’ behavior. The chassis is relatively insensitive to driver error, allowing ample safety margins and always conveys clear and relevant signals to the driver: how near the limit he or she is travelling through bends and how slippery is the road surface. Steering precision and feel are always consistent and stable. 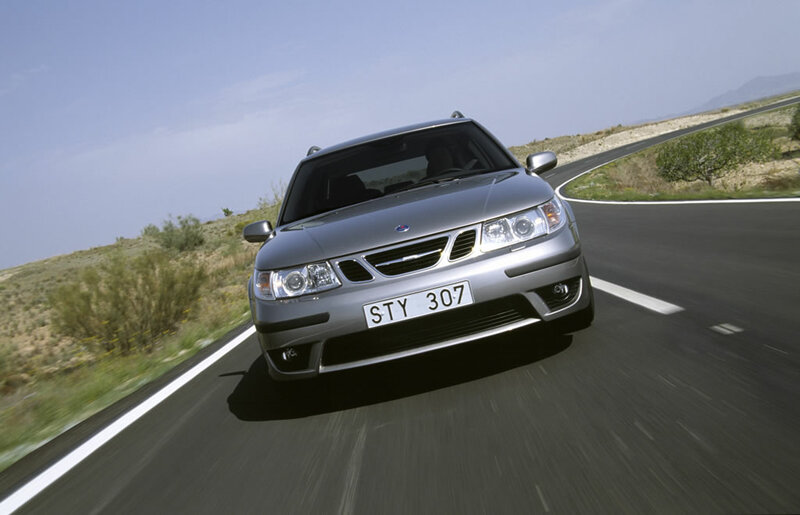 Saab engineers work on the basic premise that the more the driver feels in control, the more safely he or she drives. In addition sound chassis dynamics, a full range of electronic aids are also available. These include ABS and Electronic brake force distribution (EBD) as standard. A traction control system (TCS) and a progressive, Saab-developed electronic stability program (ESP) can also be specified. (These features are described in more detail in the Chassis, Suspension and Brakes section). As every road accident is unique, each new product development begins with studies of actual road accidents. 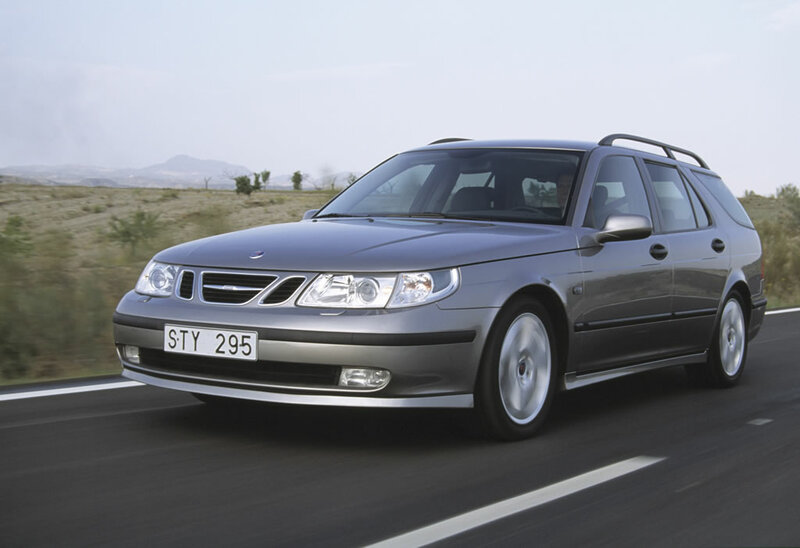 For 30 years, Saab has been continually investigating Swedish road accidents in which Saab cars are involved. 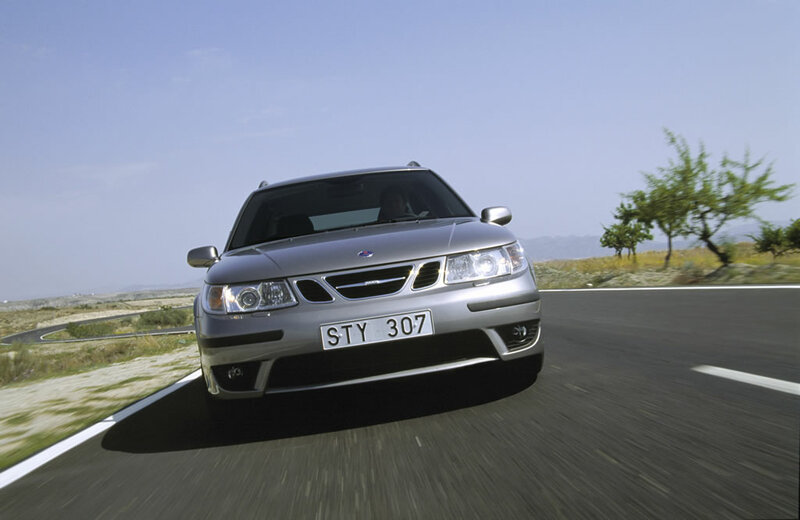 The results of the investigations are analysed by Saab medical experts together with engineers to pinpoint precisely which part of the car was, for example, responsible for an injury or how structural features behaved. By this means, engineers receive constant feedback about how their designs perform in real life, which they can then incorporate in their crash, or passive, safety work. 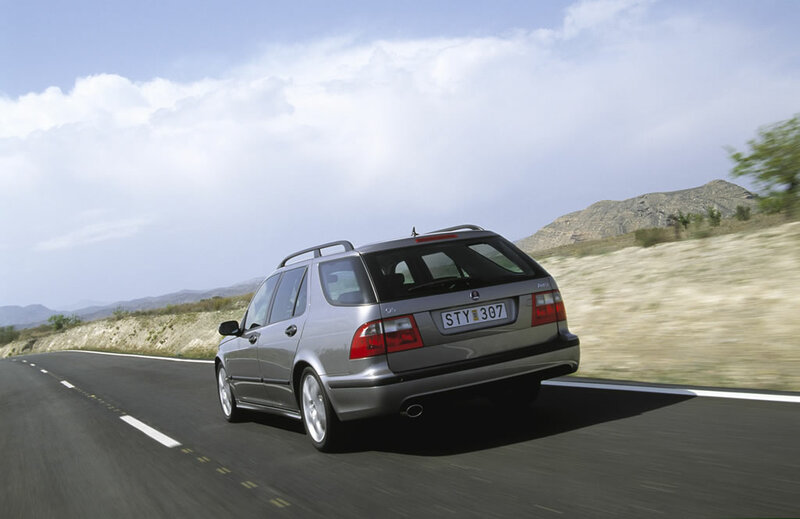 The Saab databank of statistics now covers more than 6,000 accidents, providing a unique insight into what really happens out on the road, not just under laboratory crash test conditions. Saab calls its approach ‘Real Life Safety’ because it uses information from real world experience to help protect drivers and passengers in Saab cars. 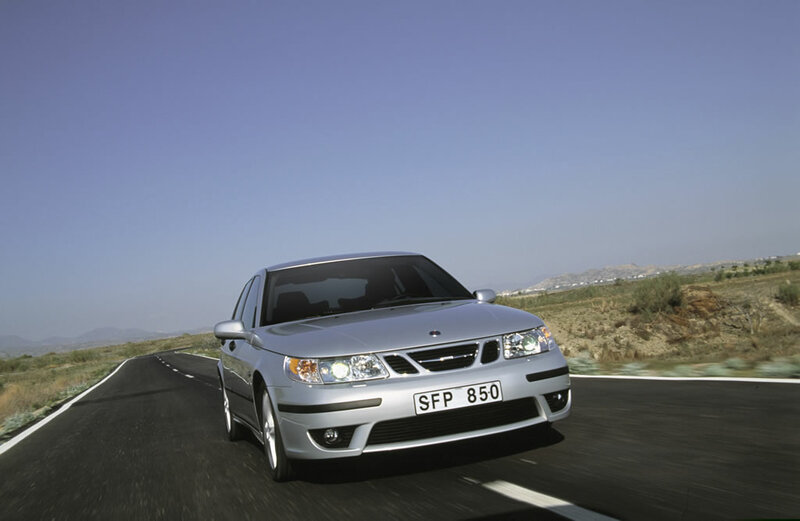 More than 40 different types of crash test were also carried out during the development of the Saab 9-5, including 18 different frontal impacts, 10 different side impacts, three rear impacts and a number of high g-force and other non-destructive sled tests. Not content with real car-to-car side impacts and the various proposed side test standards for Europe and the US, which are different from each other, Saab has also tested the new 9-5 in car-to-truck crashes. As the steering column is directly connected to the front structure, it has a unique collapsible element above, rather than below, its main attachment support. This allows the safety feature to function without first breaking away, increasing its effectiveness. 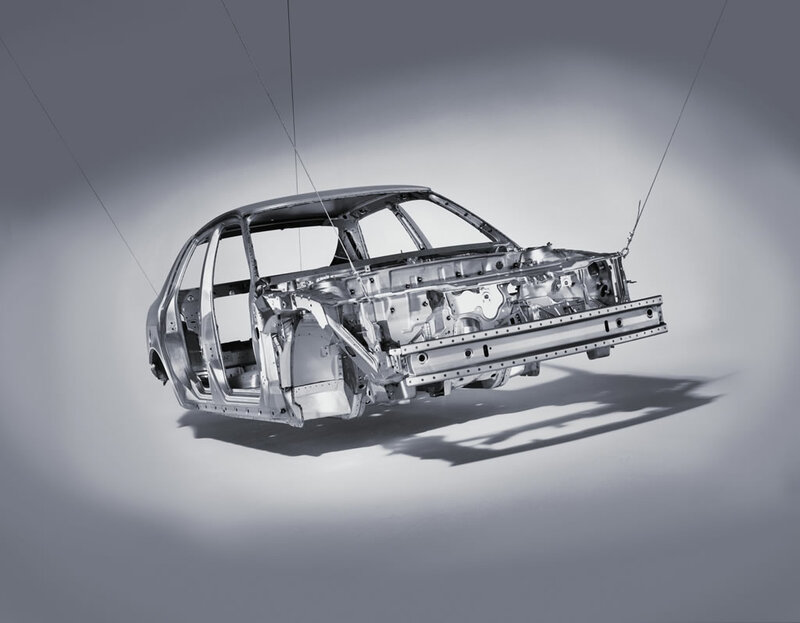 Saab engineers work on the basic principle that in the event of a crash, the car’s structure must behave in a predictable way, independent of the precise point of impact. Variables such as the crash velocity and the stiffness and shape of the object impacted should have as little effect as possible on the outcome of the accident. Saab research shows that in a frontal impact there are three criteria which must be fulfilled to achieve the crash performance needed to provide Real Life Safety. These involve stable deformation behaviour; the adoption of wide longitudinal members; and the provision of three integrated crash load paths between the front elements and the strong safety cage behind. 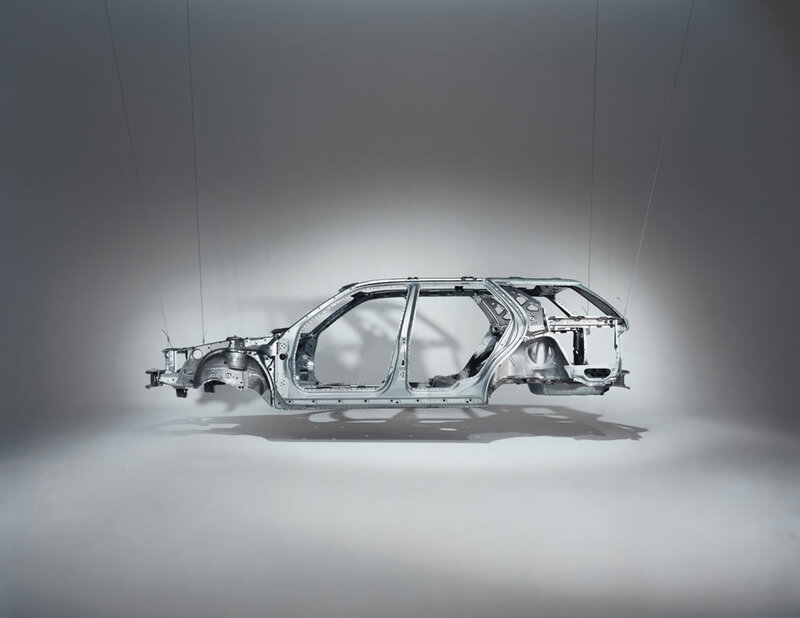 The front structure of the new Saab 9-5 therefore incorporates three robust impact load bearers that are connected to each other in a unique way to optimise and distribute crash loads efficiently, according to a predetermined pattern. At the front, which is the point of contact in the vast majority of accidents, there is an exceptionally wide and robust beam, to spread the initial forces of an offset impact to as much of the supporting structure as possible. At high angular impacts the shape of this beam even causes the car to be deflected from direct contact, further reducing the intensity of the crash forces. This beam effectively eliminates localised high stresses, reducing the risk of structural penetration and increasing the time before crash pulses reach the cabin. The wide front beam ensures that both sides of the car share in the deformation process regardless of which side is actually hit, significantly increasing the effectiveness of the total system in offset crashes. Behind the beam are two widely-spaced longitudinal beams with large cross-sections. They ensure that the energy from any kind of sharp localised impact, such as a collision with tree or lamp post, can be adequately absorbed. The principal load path is formed by these exceptionally wide and long longitudinal side members that form the front section of the body frame. They have a wide distance between them and pass around the sides of the engine bay to the main front bulkhead just above floor level. The second path transmits loads at a higher level via the wheelarch reinforcements to the A-pillars at waistline height, where the structure is heavily reinforced to carry the main door hinges. The third path uses the front sub-frame to direct crash forces to another part of the safety cage via its reinforced and widely spaced mounting points. 0-8 km/h: The self-repairing moulded plastic bumpers absorb low speed impacts and normally need no repair. 8-15 km/h: Short, front ‘crash boxes’ supporting the bumper deform in a controlled way with minimal body damage. They are made from thinner gauge metal and incorporate special pressings designed to act as folding points. 15-30 km/h: At higher impact speeds, the load boxes behind take progressively more of the total crash energy, collapsing in a controlled way so relatively little damage is caused to the body structure. 30-65 km/h: The total system starts to work, dissipating and absorbing the crash energy through all three load paths to dilute the intensity of the impact when it reaches the cabin and the occupants inside. Above 65 km/h: At high speeds, the total car will be deformed with even the safety cage starting to be deformed in a predetermined way that absorbs the higher energy levels involved. All the speeds mentioned above relate to impacts against solid, immovable objects. When other vehicles are involved the intensity of the crash forces is usually about half that against a fixed barrier at the same speed. Accidents involving actual impacts against rigid objects at speeds above 65 km/h (equivalent to about 139 km/h car to car) are extremely rare. The safety cage provides an effective survival space within an extremely strong structural frame that is designed to deform in a predetermined way, withstanding the crash forces in the most severe accidents and never breaking apart or collapsing in on itself. It is an extremely rigid system of steel members that pass around and over the front and rear seats. The parts likely to be subjected to the highest forces are reinforced by high-tensile steel and extra metal thickness and all the joints are carefully designed to resist tearing. The A and B-pillars are formed from several layers of high strength steel and a unique jointing process is used where the pillars meet the roof rails. This provides very good protection in the rare event of a rollover accident. In side impacts, the body structure is designed to distribute the stresses over as large an area as possible, using all parts of the body sides and most of the safety cage. There are strong beams in all the doors, which also have large sill overlaps to prevent them caving in. The side sills themselves are reinforced and the steel used for the door beams is four times the strength of normal steel, produced in a special patented process. The B pillars are designed with a predetermined deformation behaviour that helps protect the parts of an occupant’s body nearest to the impact. “The side structure is designed to behave like a pendulum,” says Lenhof. “This mechanism, together with our side airbag, provides the optimal protection for the more sensitive parts of the human body, such as ribs, head and chest. We allow more deformation in the lower part of the B-pillar to channel most of the forces down to the more robust parts of the body. Cross-members in the floor under the front and rear seats are designed to prevent the body from being compressed sideways and help distribute side impact forces into more of the safety cage structure. Neck injuries are one of the most common results of rear-end collisions, even at relatively low speeds, and the front seats of the 9-5 are fitted with Saab Active Head Restraints (SAHR), a unique safety system pioneered by Saab which reduces the risk of whiplash injury. In the event of a rear-end collision, the SAHR system effectively limits the head movement of the occupant during the impact sequence. The SAHR system is entirely mechanical and is based on a lever principle. The head restraint is connected by a linkage to a pressure plate in the backrest of the seat. In a rear impact, inertia forces the occupant’s body into the backrest against the pressure plate which triggers a mechanism to push the head restraint upwards and forward, catching the head and minimising any dangerous neck movement. The system is designed to come into operation in rear-end collisions from speeds equivalent to a barrier impact of 15-18 km/h. The precise activation of the system is determined by the force with which the occupant’s back is forced against the backrest, the magnitude of the collision forces and by the occupant’s weight. Its performance is always optimised automatically to match the occupant in the seat at the time and the conditions of the crash. As the SAHR system is entirely mechanical, it needs no repairs to restore it to operational condition, unlike pyrotechnic systems such as air bags. After deployment, it automatically reverts to its initial position ready of use again. The rear body provides an outstanding level of crash protection, thanks to the same kind of collapsible elements and reinforcements as seen at the front. A shield around the fuel filler neck is designed to protect it from breaking away, while the tank itself is in the safest possible place, low down just ahead of the rear axle. Under conditions of severe deceleration, seemingly innocent items stowed on-board can became dangerous. It is, therefore, insufficient to engineer substantial front impact resistance if those inside the car are vulnerable to a shifting load bursting through the rear seat from the trunk or cargo load space. For example, in a 50 kph frontal collision with a fixed barrier an 80 kilo load, equivalent to two full suitcases, undergoes 30g deceleration – in effect, weighing some 2,400 kilos, or the size of a small elephant. 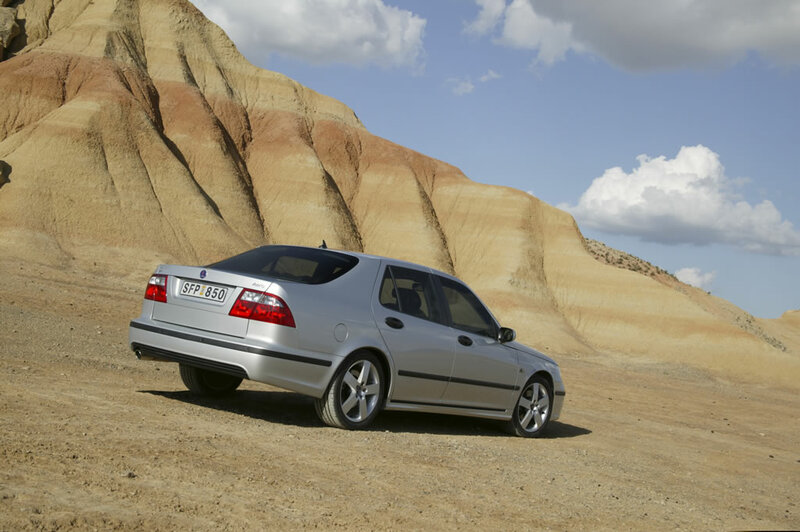 Both the 9-5 sedan and wagon, therefore, have extremely rigid seat-backs which can withstand such forces. All five seating positions are provided with three-point seat-belts, those for front occupants having pyrotechnic pre-tensioners and load limiters fitted. The ‘adaptive’ deployment of both 65-liter driver and 145-liter front passenger airbags utilises a system of on-board crash impulse sensing together with switches that detect the seating position and whether or not a seat-belt is being worn. In this way, the force of inflation may be level 1 or level 2, depending on the severity of the crash. Likewise, the force of inflation can take account of how close the occupant is sitting to the steering wheel or fascia and if a seat-belt is being worn. Some-one sitting close to the wheel, for example, would be better protected by a lower pressure inflation, or level 1, and anyone not wearing a seat-belt would always benefit from the higher pressure, or level 2, activation. For side impact protection, double action head/thorax airbags are mounted in the side of the backrest of each front seat. These 20-litre airbags have two sections – one protecting the rib cage, which is activated first, and the other providing head protection. As well as placing the ignition key in the centre console, well away from the driver’s knee contact zone, further protection is provided by an aluminium section behind the plastic foam padding under the fascia which gives way in high speed impacts to absorb energy and reduce the risk of injury. 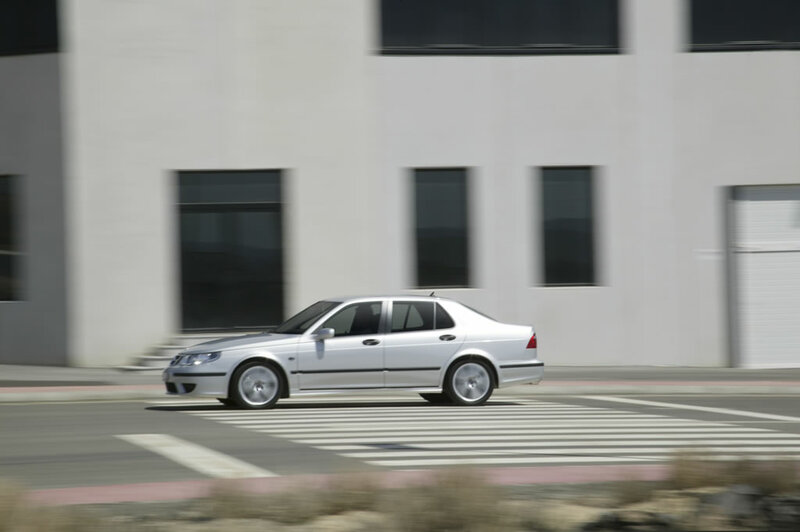 In typical Saab tradition, the chassis of the 9-5 has been developed so the driver remains in control at all times by receiving clear signals about what the car is doing. It is really a two-way communication involving how the car responds to driver inputs, as well as what kind of signals are fed back. The chassis is designed to deliver a sporty driving experience and an excellent ride quality. To achieve this, the high level of directional stability, roadholding and body control is matched by an ability to absorb bumps smoothly so that the interior is effectively insulated from road shocks and noise. The balance of the car is communicated through the seat to the driver’s hips, which are located as close to the car’s center of gravity as possible, making chassis behavior easier to sense and shortening the driver’s reaction time to ensure close control. 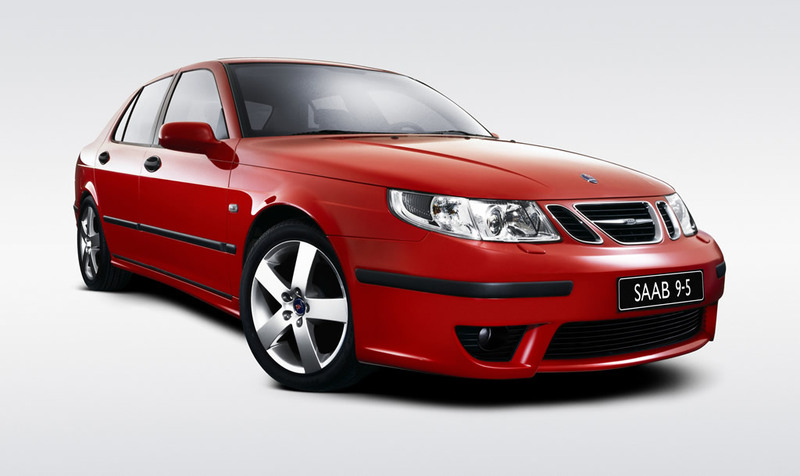 Stability, responsiveness and predictability are essential Saab 9-5 chassis characteristics and the driver receives ample warning before any limits are reached. Isolated front and rear sub-frames are adopted to attenuate disturbances from the road, contributing to the high level of running refinement required in a car of this class. MacPherson struts are retained for the front suspension and an independent, multi-link system is used at the rear. Anti-roll bars are fitted front and rear. The wheelbase is 2703 mm and the track, front and rear, is 1522 mm. As well as improvements to ride comfort from the introduction of sub-frames and the split rear axle, spring rates and chassis mountings were also optimized to further increase insulation from noise, vibration and harshness. “We have also balanced the front and rear ride frequencies to give a flat response over bumps without uncomfortable pitching,” adds Ekkehard. The aluminum front sub-frame extends around the perimeter of the lower engine bay. It is both light and stiff and is attached to the main body structure via six insulating bushes. The pressed steel lower wishbones have widely-spaced pivots that apply toe-correcting geometry for a self-stabilizing effect when braking on road surfaces with varying degrees of grip. The upper strut mounts are ‘de-coupled’ for separate spring and damper load paths into the front structure, improving insulation from road shocks and allowing better control of ride characteristics. The coil springs are offset to reduce bending loads in the shock absorbers for more effective damping. An 18 mm diameter anti-roll bar is mounted on bushes at the rear of the sub-frame and connected to the struts by long vertical links. The power-assisted steering rack is also mounted on the rear of the sub-frame so it can operate with short tie rods and provide very precise wheel control, giving a good steering response and feel. All the suspension bushes are directionally optimized so that the chassis is soft longitudinally, to isolate the system better from sharp road shocks, but stiff laterally for maximum wheel control. The multi-link rear suspension is also mounted on a separate sub-frame, attached to the rear body structure by four large-volume elastomer bushes. Each wheel is controlled by three links, two mounted transversely to form the split axle and the third installed as a longitudinal trailing arm. The two transverse links on each side pivot on cylindrical bushes mounted on the sub-frame, while the trailing arm is attached to the body through similar bushes mounted in rigid brackets. The vertical spacing of the ball joint pivots on the wheel hub assembly is wider than the spacing at the inboard end, to control wheel camber on bump and rebound. The relative dimensions of the links, elastomer materials and the detail design of the suspension bushes are all optimized for good lateral wheel control and enhanced ride quality. The diagonally-split braking system uses ventilated 288 mm front discs, with single piston calipers, and solid 286 mm rear discs with twin piston calipers. Twin 8-inch and 7-inch booster units reduce pedal effort and provide a sensitive, progressive braking feel. Electronic brake force distribution (EBD) and ABS is standard. 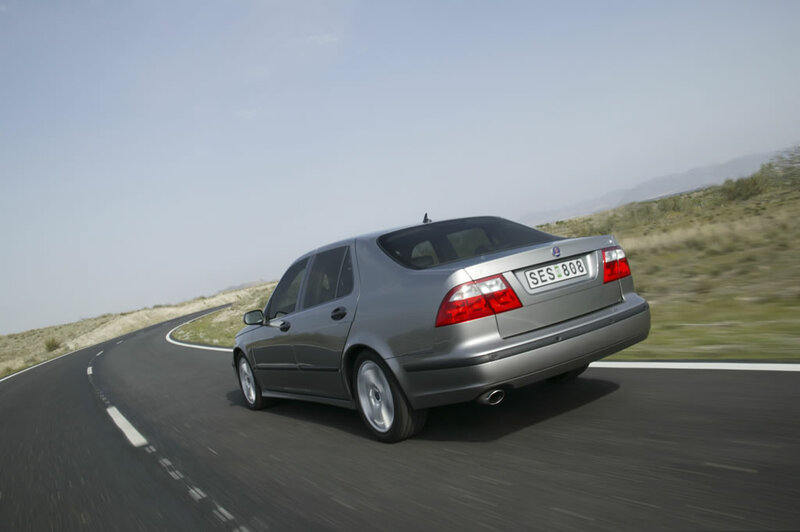 The switchable electronic traction control system (TCS) can be specified separately and is also included in the Saab-developed electronic stability program (ESP). The ABS system incorporates wheel sensors so that as soon as any wheel begins to lock, brake pressure is diverted from that wheel to a supplementary low pressure hydraulic reservoir. When the wheel accelerates back to the vehicle speed, brake pressure is then restored. The system can cycle in this way up to 12 times a second so the wheel keeps rotating at the point of locking, allowing the driver to maintain steering control while stopping in the shortest possible distance. EBD comes into effect under hard braking before the ABS is activated, balancing the friction available between each axle with the braking forces being applied. It automatically provides optimum retardation, given the weight of the vehicle and the prevailing road conditions. The system is managed by the integrated ABS controller, which compares rear wheel slip to that at the front as a reference point. As soon as significant differences are detected, pressure to the rear hydraulic system is modulated to provide the most balanced effect without operating the electric ABS pump. TCS works in conjunction with the engine management system to prevent the driven wheels from spinning if tyre grip is lost under acceleration. The system utilizes the ABS wheel sensors to detect wheel slip and operates the front brakes individually, to transfer torque to the wheel with the most available friction. If both wheels spin together, it also signals the engine management system to reduce engine torque by over-riding the electronically-activated throttle. A warning light on the instrument panel illuminates when the traction control is operating, to warn the driver of slippery roads. The TCS system is fully automatic in operation, but includes a cancelling switch for special circumstances (such as when snow chains are fitted) which can only be used at low speeds. (below 60 km/h). 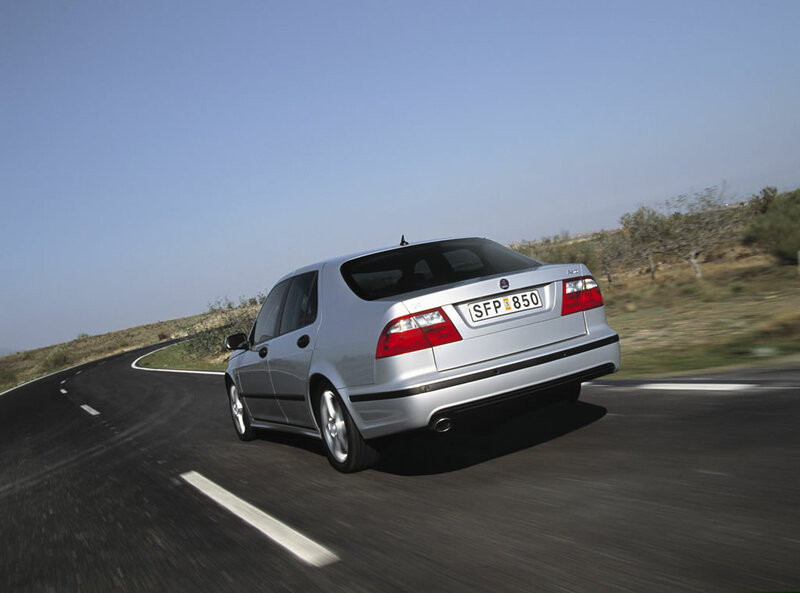 The ESP uses Saab-developed software for progressive and smooth interventions to prevent the vehicle skidding. It incorporates a yaw sensor and a steering angle sensor. Inputs from these sources are then correlated with the speed of the car. The system is programmed to execute whatever actions are necessary to prevent the onset of a loss of control. Depending on the chassis’s disposition, it is possible for braking to applied via the ABS system to all four wheels at once, in addition to control of the electronic throttle. The impressive all-turbo powertrain menu includes a choice of four gasoline and two diesel engines, ranging in power from 150 to 250 bhp and all developed to deliver characteristically strong low and mid-range torque. These are allied to a five-speed manual gearbox or an adaptive, five-speed automatic transmission that includes Saab Sentronic manual gear selection via steering wheel buttons (not with 2.2TiD engine). The four cylinder gasoline engine is fitted with four valves per cylinder, double overhead camshafts and counter-rotating balancer shafts for additional refinement. The entry level 2.0-liter engine develops maximum power of 150 bhp and the 2.3-liter version delivers 185 or 220 bhp, and 250 bhp for the Aero only. The diesel line-up consists of a superb, state-of-the-art, 3.0-liter V6, delivering 176 bhp and combining strong, sporty performance with typical diesel fuel economy, and a 120 bhp, four cylinder 2.2-liter TiD unit. The larger engine is focused on sporty performance and offered only with a manual gearbox, while the smaller unit is available with manual or automatic transmission. All engines – except for the 2.2TiD unit – are fitted with Saab’s own Trionic 7 electronic engine management system, developed in-house. It simultaneously controls the ignition timing, fuel injection, turbo boost pressure and the electronic throttle, eliminating the need for a distributor, central coil and separate spark plug leads. All engines are designed to be highly responsive, delivering strong torque at low engine speeds for safer overtaking and a more relaxed driving experience with fewer gearchanges. Unlike many naturally-aspirated engines of similar power, it is not necessary to maintain high engine speeds for strong performance because turbocharging ensures exceptional torque is readily available between 2,000 – 4,000 rpm, the engine speeds used in everyday driving. The variants use the same aluminum alloy cylinder head, chain-driven camshafts and cast-iron block with a 90 mm bore, half-siamesed cylinders and five main bearings. They operate within a range of varying maximum boost pressures. The 2.0-liter, with a 78 mm stroke, develops 150 bhp at 5,500 rpm. The 2.3-liter version, using a longer 90 mm stroke, is configured to produce a maximum power of 185 bhp or 220 bhp at 5,500 rpm and, in its ultimate expression for the high performance Aero model, 250 bhp at 5,300 rpm. These engines are all characterised by an exceptionally flat torque curve – frequently likened to the distinctive profile of Ayers Rock in Australia! The 150, 185 and 220 bhp engines develop their generous maximum torque – 240, 280 and 310 Nm respectively – all the way from at least 1,900 to 3,500 rpm, hence the completely straight line that represents ‘peak’ torque. It is a similar picture for the 250 bhp Aero engine, with exceptional torque of 350 Nm being generated between 1,900 and 4,000 rpm. 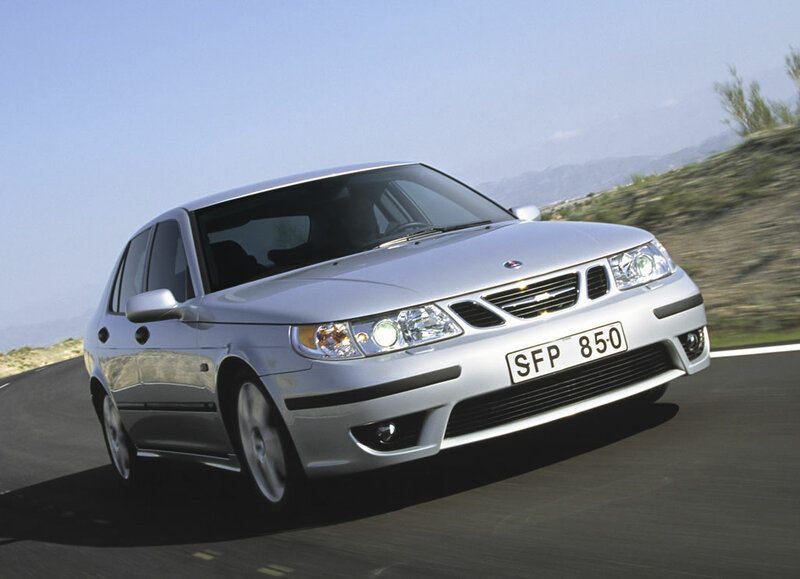 The power of Saab’s Trionic engine management system has also allowed engineers to program a unique ‘superboost’ facility which raises torque yet higher, to 370 Nm, for up to 20 seconds. This is automatically engaged at full throttle openings for even swifter overtaking. For good running refinement, two counter-rotating, chain-driven shafts are fitted with eccentric counterweights and off-set mounted in the engine block. They rotate at twice crankshaft speed, effectively ironing out secondary engine vibrations. The fuel injectors are controlled individually to provide two jets aimed at the inlet valves for more complete combustion. Special jets also spray cooling engine oil to the underside of the pistons at the bottom of their stroke, a feature more commonly seen in competition engines. For effective damping, to prevent valve bounce at high engine revs, short secondary springs are inserted inside the main valve springs and remain uncompressed as long as the valve is closed. The reduced mass of the inlet valves also means they warm up more quickly from cold, eliminating the need for inlet heater plates. 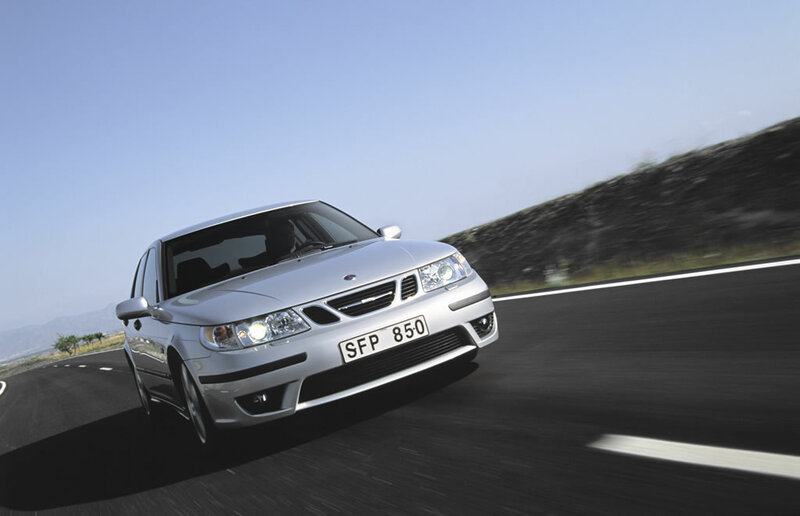 This state-of-the-art, Saab-tuned engine demonstrates that sporty performance and a frugal fuel consumption are not mutually exclusive requirements. Maximum power of 176 bhp at 4,000 rpm and massive peak torque of 350 Nm, from just 1,800 rpm, produce vivid zero to 100 kph acceleration in just 9.3 seconds and an equally impressive combined cycle fuel consumption of 7.3 l/100 km. This common-rail, direct injection engine is remarkably light and compact, thanks to its all aluminum construction and a narrow 66 degree vee angle and an over square bore/stroke of 87.5/82 mm for extremely compact dimensions. It has a low center of gravity and is perfectly suited for a transverse installation. The intercooled turbocharger uses variable pitch vanes (VNT) for a quick throttle response and there are four valves per cylinder with a single, low maintenance, belt driving all four camshafts. Extensive exhaust gas recirculation (EGR), for reduced NOx emissions, is extremely sophisticated. through the introduction of electrical, instead of pneumatic, control. This allows more accurate and faster EGR, which contributes to improved engine pick-up from low speeds. Before EGR commences, the gases are also cooled by a water/air heat exchanger, which helps reduce engine temperatures and improves performance still further. The emphasis is tightly focused on fuel economy for the four cylinder, 120 bhp, 2.2-liter turbo diesel unit, which is available with both automatic and manual transmission. Extra urban cycle fuel consumption of just 6.6 l/100 km adds up to an impressive potential cruising range of some 1,200 km. 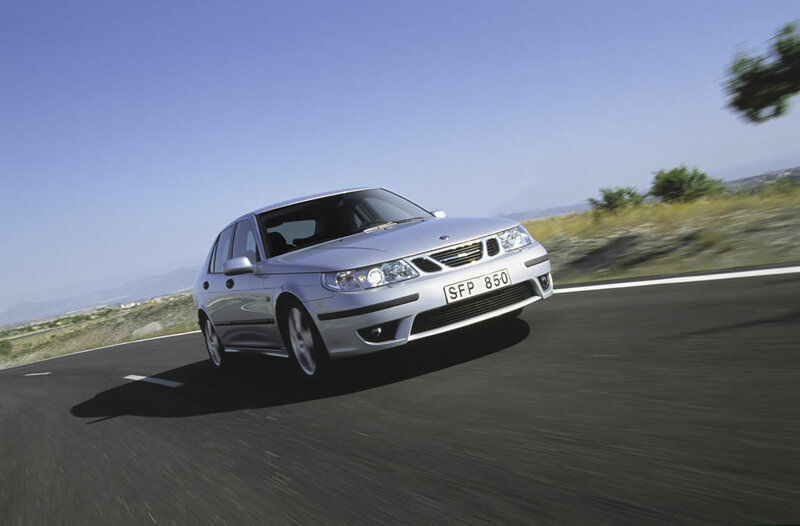 Combined with the Saab 9-5’s high levels of comfort and refinement, this engine variant offers a superb package for effortlessly covering long distances. Of course, it is not short on performance, either, with a strong 280 Nm of torque generated from just 1,500 rpm. It is a direct injection, 16-valve unit, with a single overhead camshaft, a cast-iron block and twin balancer shafts for smoother running. High pressure jets, up to 1,300 bar at their nozzles, and a double induction system for increased ‘swirl’ both promote highly efficient combustion. Exhaust gas recirculation also helps to lower NOx emissions. Convenience and sporty performance are both perfectly combined in the sophisticated five-speed automatic transmission, which incorporates Saab Sentronic manual gear selection via steering wheel buttons. Manufactured to Saab’s specification by Aisin AW, the transmission constantly monitors its surroundings, adapting shift patterns to the prevailing conditions. For example, it can detect changes in altitude and engine performance, or if a trailer is being towed, and will optimise its gear shifting patterns accordingly, staying within the engine’s ‘sweet spot’. This is facilitated by a high-speed CAN databus connection which provides a continuous flow of information between the Trionic engine management system and the automatic transmission’s control module. In higher gears, the changing process is also made more efficient by the use of a clutch within the torque converter to directly engage the transmission, eliminating some of the frictional losses associated with traditional torque converters. This system gives a small gain in fuel consumption but is not applied to low gears because of excessive resonances. In addition to selecting ‘normal‘, ‘sport’ or ‘winter’ modes, the driver can also enjoy close gear changing control akin to that of a manual transmission by using Saab Sentronic steering wheel buttons. With the selector lever in the ‘M’ for manual position, the driver can execute swift sequential changes via the buttons – the right one for ‘up’ changes and the left for ‘down’ changes. 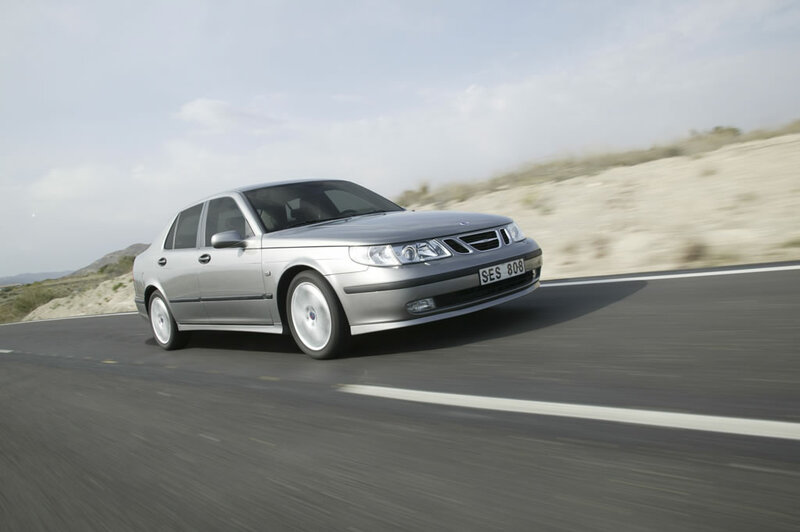 Saab Sentronic manual selection is fitted as standard in all powertrain applications, except for the 2.2 TiD engine. Servicing costs are also reduced because the transmission is a ‘sealed for life’ unit. The transmission fluid is a high grade mineral oil which has been specially formulated to last for the life of the vehicle. 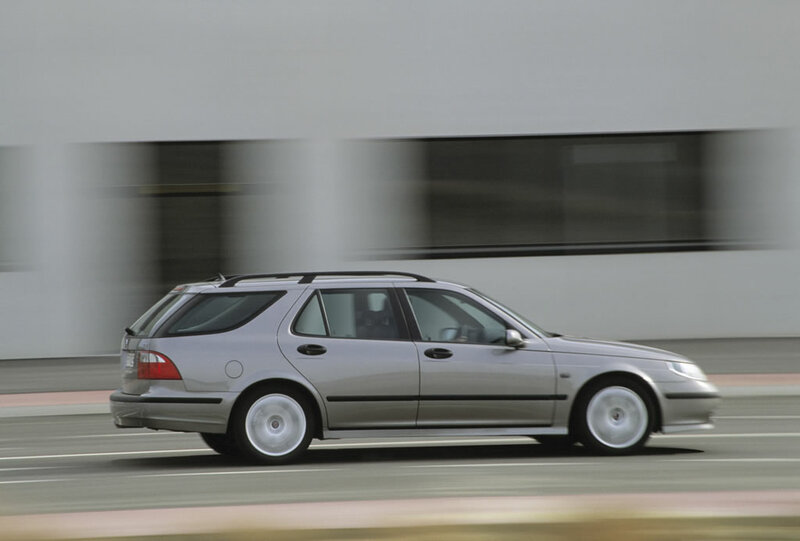 Saab is unique in the premium sector for developing its own engine management system. 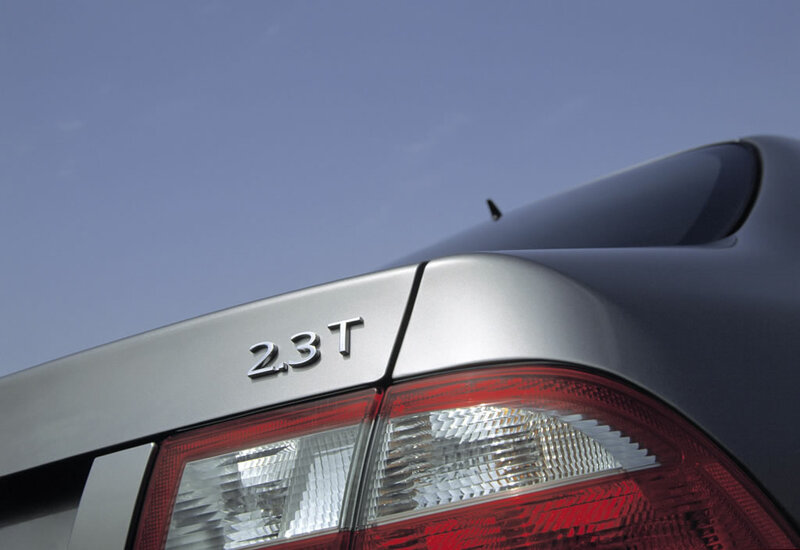 The Saab 9-5’s Trionic 7 system controls all engine variants, except the 2.2TiD unit, and is capable of carrying out two million calculations per second, making it the most sophisticated management system in commercial production for turbocharged engines. The brain of the Trionic system is a 32-bit microprocessor which is programmed with complex algorithms and theoretical models of the engine’s performance. It is able to monitor and control simultaneously the ignition timing, fuel injection rate, turbo boost pressure, the intake air flow and the ‘drive by wire’ electronic throttle. Control is adaptive, which means that the system adjusts all calibration points, taking into account variations in engine parameters and operating conditions. Trionic analyses the combustion process by using the spark plugs for individually measuring and adjusting ionisation rates in each cylinder. A weak voltage is applied across the gap of the spark plug after each combustion stroke. The current flowing back to the control unit is dependent on the number of ions that have been formed, providing a measure of the quality of combustion by revealing whether the fuel/air mixture has ignited and burnt correctly. If not, the system adjusts the fuel quantity, the ignition timing or the boost pressure. The Trionic system can control each cylinder individually, which is a more accurate way of managing the engine’s performance than using averages of measurements carried out at only one point. This continuous monitoring enables the fuel energy to be put to optimum use. The result is a reduction in fuel consumption and exhaust emissions. Immediately before each injector opens, the optimum amount of fuel required for each engine cycle is calculated on the basis of engine load, speed, temperature and a range of other operating variables. The processor is so fast that it even checks during the injection phase whether any factors have changed, making in-cycle corrections if required by varying the fuel pulse from a minimum of two milliseconds (1/500th sec) to the complete four stroke cycle. The direct ignition system has no distributor or moving parts. Each spark plug has its own miniature ignition coil mounted in a cartridge directly above its terminal, eliminating the need for high-tension leads and protecting the plug insulator from moisture and dirt. This arrangement minimizes starting problems in damp and cold weather and provides a more reliable spark voltage under all conditions. A capacitive rather than a conventional inductive system is used to generate the spark voltage, which at 40,000 volts is some 40 per cent greater than that provided in old distributive ignition systems. It has the capability of providing a series of separate sparks instead of only one, burning off any soot or wet fuel that may have collected on the electrodes during difficult cold starting conditions. Ignition timing is set during engine assembly and needs no service attention. 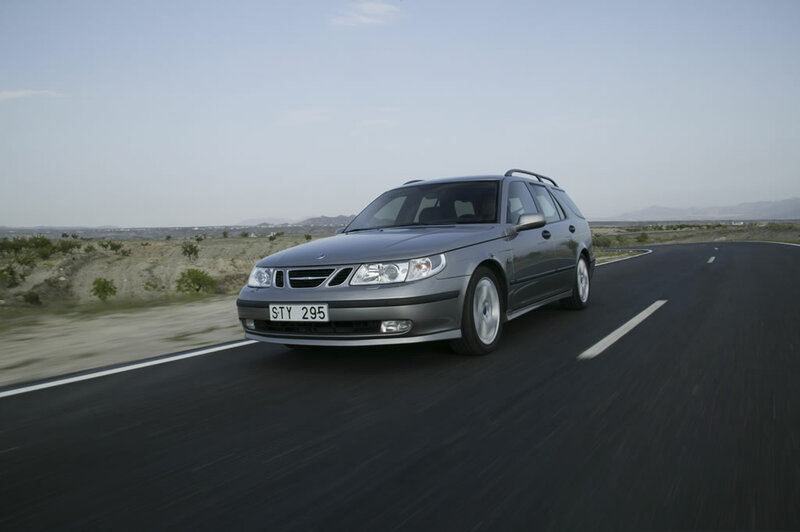 The Saab 9-5 is fitted with two advanced data bus systems which communicate information within the vehicle via a digital network of only two wires instead of many different wiring circuits and harnesses. This technology saves weight, complexity and cost, as well as providing more reliable and robust connections. Engine temperature data, for example, which might be needed by several different processors, can be sent around the system and updated continuously as a single message packet, instead of each system independently gathering its own information signal from its own dedicated sensor. The I-bus is linked by a selective gateway to the powertrain bus (P-bus) for Saab’s own Trionic engine management system and the automatic transmission control module (TCM). The ABS and Traction Control System (TCS) are linked separately to the Main Instrument Unit (MIU). Vehicle road speed signals, for example, are obtained from the ABS controller, which is separate from both bus circuits, and sent to the main instrument unit which then transmits it to the data buses. These two Controller Area Networks (CANs) allow all parts of the systems to talk to each other on a ‘need to know basis’ at extremely high speed, enabling them all to access the same data and interact very rapidly when necessary. The P-bus runs at 10 times the speed of the I-bus because the engine and transmission require updated real-time information much more quickly than the other systems. It has been developed with the capacity to transmit data at up to one million bits/sec (about 100 times the speed of a fax machine and 35 times the speed of the latest V34 modems). Information is only transmitted between the two bus systems on a selective basis because data that is relevant to only one part of the system, such as engine torque for the P-bus, or the lighting rheostat level for the I-bus, is best contained within its own network. 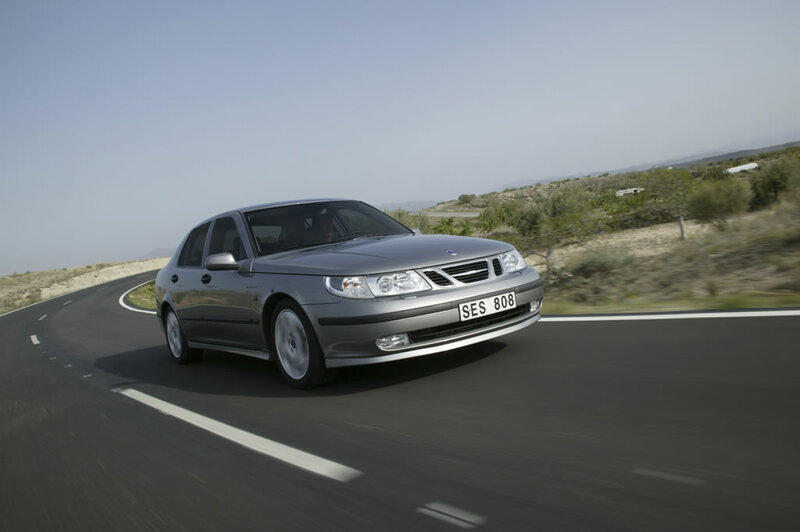 It was a deliberate decision to keep the headlamps of the Saab 9-5 relatively large. This has allowed lighting engineers to increase the efficiency and output of the units by 25 per cent rather than maintain the previous performance levels with a smaller housing. Behind the clear plastic, scratch-resistant lenses, ‘complex surface’ reflectors are designed so that each small part of the reflector’s surface is treated as a separate element, directing light to a specific part of the road ahead. Twin halogen H7 bulbs, are fitted in each unit and arranged so that the high beam supplements the low beam, which stays illuminated at all times. The bulbs incorporate a darkened cap to reduce glare for other road users on high beam, which is disturbing when driving at night in bad weather conditions (such as rain, snow or fog). Xenon bulbs use a gas discharge, instead of a glowing filament, to produce a searing, white beam that is twice as powerful as that emitted from a conventional halogen bulb. 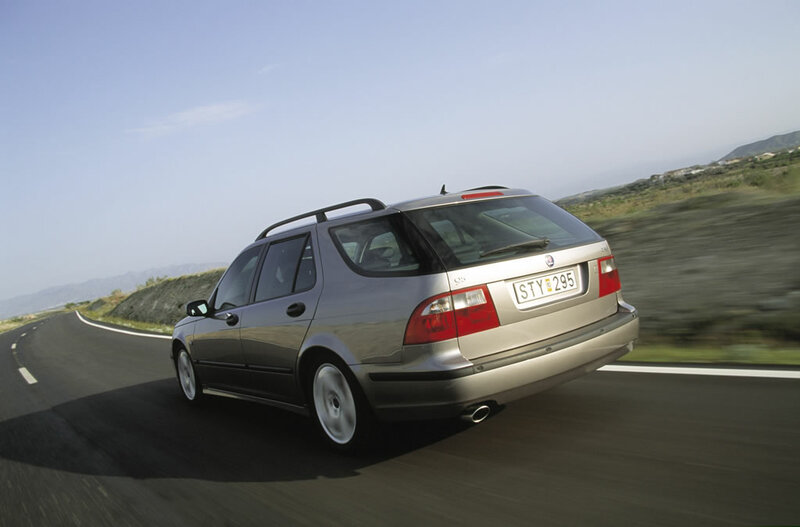 Saab is one of the first car manufacturers to adopt this technology. And for the 9-5, Bi-xenon lighting is available as an option and uses a single xenon bulb and projector unit to provide a high and low beam by raising or lowering a shutter in front of the bulb. It is used together with a conventional high beam-only halogen bulb and the resulting spread of light is about 60 per greater than the 9-5’s exemplary all-halogen set-up. Front fog lamps are integrated in the lower front bumper mouldings and the tail lamps have large lens areas and illumination levels that exceed all legal requirements by a generous margin. They are well separated and supplemented by a third central high-mounted rear brake light. Car entry ‘puddle’ lights are mounted in the bottom of the front doors, so they show the ground as soon as a door is opened. Interior floor and overhead lighting for each seating position dims progressively when switched off via the automatic, delayed-action timer. To protect the battery from discharging, any lights left on inadvertently by the driver are turned off automatically 20 minutes after leaving the car. A battery of three double screenwasher jets provide six powerful sprays that rapidly cover the entire windscreen. They are operated by an integrated wash/wipe stalk control and use exceptionally high pressure – 3.0 bar instead of the usual 1.8 bar – to provide a high-velocity flow from the large 6-litre reservoir. The washer system has been developed to provide extremely efficient performance, particularly at higher speeds or in low temperatures. The wipers have two fixed speeds and a variable intermittent feature. Their arms have been developed in the Saab climatic wind tunnel to keep the blades firmly on the glass, even at maximum speed. A separate pump supplies water from the same reservoir as the ‘pop up’ headlamp washer jets, which operate automatically whenever the windscreen is washed. The audio system has been carefully designed to match the interior acoustic characteristics of the 9-5 sedan and wagon. There are three systems, all with steering wheel mounted controls and an aerial integrated into the rear window. The entry level system (AS1) is based around a high quality CD/FM/AM RDS tuner with traffic announcement and programme facilities as well as ‘best signal’ selection. Frequency, station identity and program information are shown in the Saab Information Display (SID). This system plays through four 15-watt full-range speakers located in the instrument panel and rear doors. Those in the front are 86 mm diameter and those in the rear doors 123 mm diameter. Main switch controls and push buttons are located in the centre console above the climate control system. Controls for the most frequently used functions – volume, audio source, seek and selection of preset stations – are repeated on either side of the airbag housing in the centre of the steering wheel, within an easy thumb-stretch of the rim. The top-of-the-range system (AS3), using components supplied by Harman Kardon, has a power amplifier uprated to 175 watts and two oval sub-woofer speakers (152 x 289 mm) added to the rear parcel shelf. 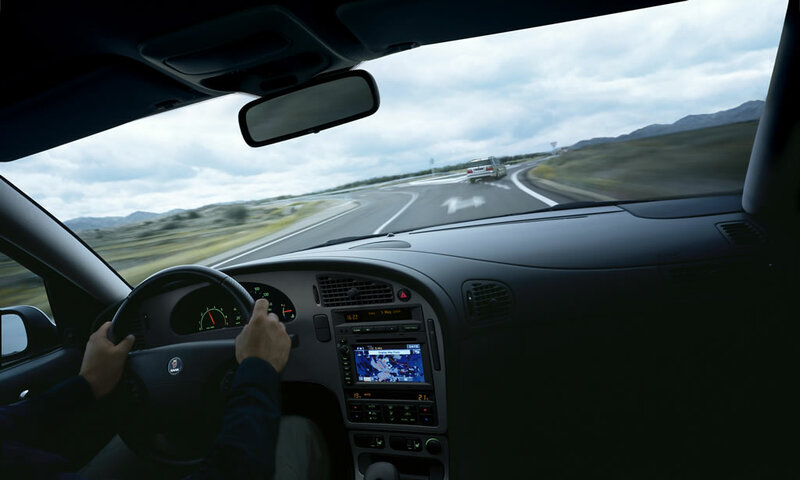 All systems feature a ‘smart’ speed sensitive, volume control which automatically compensates for the inevitable slight increase in ambient noise levels as road speed increases. In the latest equipment, the degree of compensation is related to the initial volume setting, relatively quiet settings being increased more than higher volume settings. Volume settings are automatically decreased as the speed reduces. A DVD-based navigation system, with a large 7.0-inch color screen integrated in the central console, can be specified in combination with the AS2 or AS3 audio systems. A DVD unit in the trunk allows cross-border route guidance throughout Europe without the need to make a disc change (not available for US market). 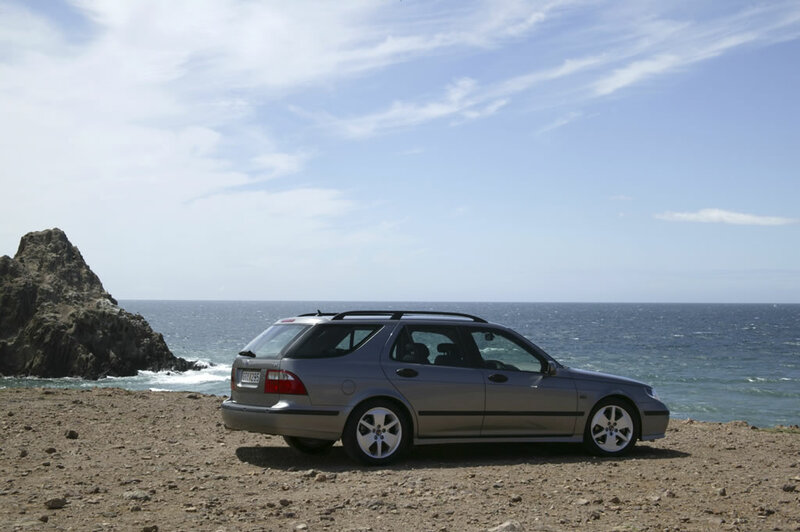 Both the sedan and wagon offer high levels of comfort and a number of convenience features that make for enjoyable and practical everyday motoring. These benefits range from superb interior climate and air quality control to an excellent load-carrying capability and innovative design features to make the driving experience more pleasant. No less than seven vents are provided in the cabin, three for the driver, two for the front passenger and two for rear passengers in the back of the centre console. For optimised defroster/demister control there are two outlets on each side of the fascia , one directed to the middle and the other to the lower part of the windscreen. 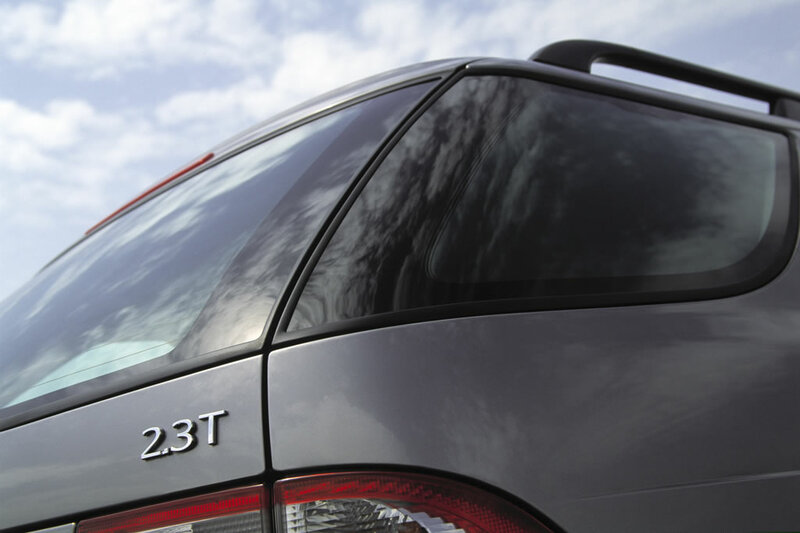 Four dedicated demister vents are also provided on the fascia and in the B-pillars, one immediately ahead of each side window. Computational fluid dynamics (CFD) were used to optimise the system’s performance, including the analysis of the complex motion of gases, lubricants and coolants inside the engine, as well the prediction of aerodynamic flow patterns and pressure gradients over internal surfaces. Readings from five separate sensors are used to optimise temperature, air distribution, air recirculation and fan speed settings. These provide the ambient outside air temperature, interior cabin roof temperature and left and right zone temperatures, also closing the control loop by checking that the system has obeyed its instructions and produced the desired effect. A sensor on top of the fascia measures the sun’s position and the intensity of the sunlight entering the cabin. Using a Saab-patented algorithm, a processor then calculates how much left/right or upper/lower compensation is needed by the air distribution system to provide the selected cabin temperature balance. The air conditioning compressor can then vary the quantity of refrigerant it pumps through the system in order to achieve the temperature reduction required, using less energy than a fixed capacity unit. Green-tinted heat-absorbent glass is standard. It prevents about 50 per cent of the sun’s thermal radiation entering the cabin, reducing the energy required to drive the air conditioning system. 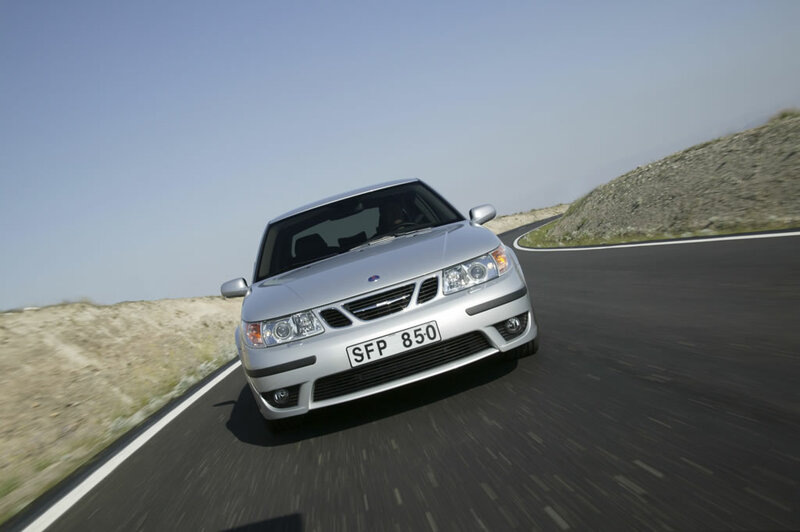 Saab cars have been fitted as standard with a cabin air filter since 1990 and the 9-5 uses a combined electrostatically-charged and carbon filter which removes airborne particles as small as 4 microns (0.004 mm) in size. It collects dust, soot and pollen, as well as small droplets of oil which can contribute to that greasy haze that often forms on the inside of car windows. The carbon filter element removes chemicals such as hydrocarbons (benzene, butane, etc. ), nitrogen oxides, sulphur dioxide, ammonia, formaldehyde, acrolein and ozone, and as well as odours. The on-board stowage of oddments has received particular attention. In total, there are 9 storage locations inside the cabin. Conventional pockets in the lower trim panels of the front doors are supplemented by stowage pouches on the front edge of both front seats, map pockets in the front seat backs and cubby holes in both the front and rear center armrests. The generously-sized glove box is linked to the air conditioning to provide a cool box at around the temperature of a domestic fridge (6°C.). Ideal for stowing chocolate or a cold drink! Four cup-holders are provided. One is elegantly designed to fold out from a slot in the instrument panel adjacent to the driver, cleverly twisting to form a horizontal support ring. Another can be deployed in the centre console, while two more are under the padded lid of the folding rear center armrest. 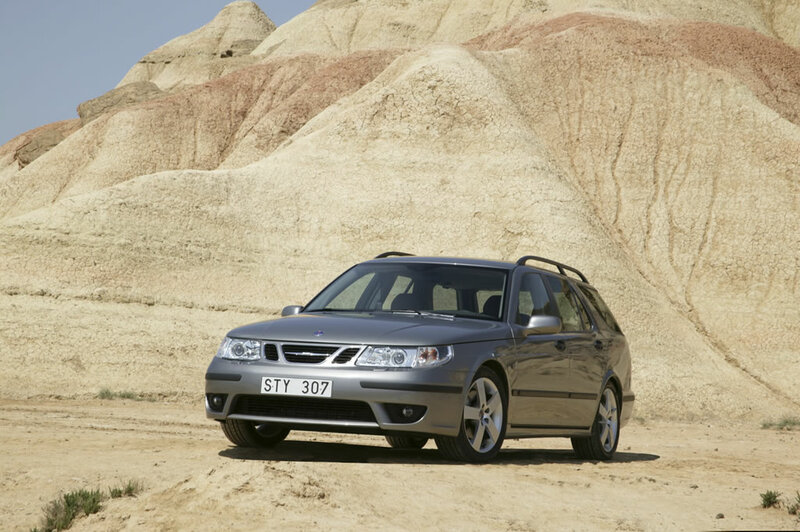 Versatility has always been part of the multi-dynamic appeal of the Saab brand and both the 9-5 sedan and, of course, the wagon offer considerable scope for carrying loads. 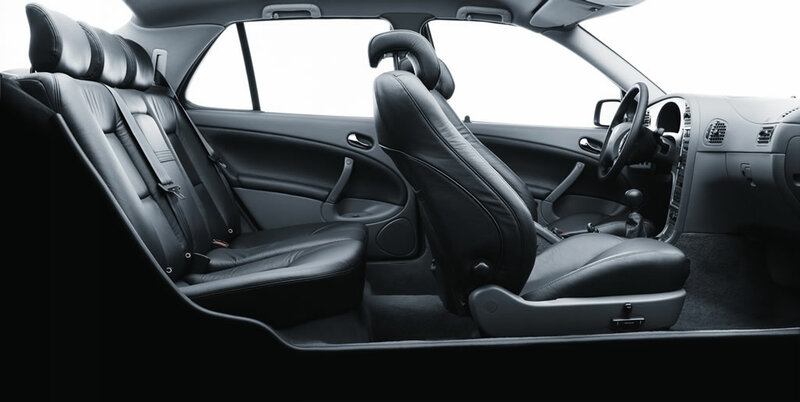 In the sedan, either or both sections of the 60/40 split-fold rear seat-back can be folded down so the trunk can accept objects up to 1655 mm long. To facilitate this process, the adjustable rear head restraints can be folded flat on their mountings. There is also a ski hatch behind the folding center armrest. The wagon offers extremely adaptable load-carrying configurations that are easy and safe to use. Attention to detail is characterised by the design of the tailgate. Careful counter-balancing makes it very light, almost ‘weightless’, to raise and lower. It also opens extremely high, arcing up through 91*, to 1865 mm in height, allowing tall people to stand under it without banging their heads. The gas struts are integrated into the hinges, helping to keep the loading area as clear and uncluttered as possible. The cargo area is easy to adapt to different needs. For normal loads, the flat rear floor, without any awkward corners, offers generous space. To extend the load area, the 60/40 split rear seat squabs and backrests can be folded as desired – it is not necessary to remove the rear head restraints – in order to produce a completely flat load bed without any upward slope towards the front. Whilst load-carrying should be easy and convenient, it must also be safe. And here the wagon features Saab’s innovative Cargo Tracks, an example of technology crossover from the aircraft industry. The two floor-mounted aluminium rails extend longitudinally down either side of the load area (in aircraft they are used to position and secure seats or cargo) and provide the best load-securing system on the market in terms of safety, flexibility and user-friendliness. Four spring-loaded attachments snap into the tracks and can easily be moved to any desired position. Fitting two either side offers a strong foundation for securing cargo in conjunction with the load straps or an elastic net, provided as accessories. Tests have shown that the tracks are so strong, the entire car can be suspended in mid-air from just one of them! When the Cargo Tracks aren’t in use, two plastic strips cover them up. The sliding floor is a useful accessory for the wagon. As well as making the process of loading and unloading less strenuous, it can also double as a bench for sitting on under the shelter of the tailgate. That is why it is the strongest on the market, able to carry the weight of two people (max.load 200 kg). When not in use, the sliding floor is invisible and leaves the rear floor completely flat and easy to load. It is deployed by simply pulling the usual floor release handle. The floor pulls out easily on rollers and can be extended by almost half a meter, locking out automatically. In this way, it is easy to load heavy items at a convenient height without having to lean forward into the cargo area. Two people can stand either side of the rolled out floor when loading. Pushing the sliding floor back in is equally easy. The lock mechanism is released by pulling the handle, which allows the floor to roll back without effort. The Cargo Tracks make it particularly simple to stow and carry cargo without any risk of the load shifting. When accommodating a heavy load, the sliding floor cannot be lowered into the rear floor (otherwise the sliding floor and the weight of the cargo would have to be lifted for unloading). The lock mechanism still makes sure that the floor is safely in place during transit. The double front sun visors are a unique feature to reduce the risk of being dazzled by sun glare. The first hinged flap in front of the driver or front passenger can be unclipped and swivelled to shield the upper side window, while a second hinged flap can then be lowered to cover the top of the windscreen. This adds to primary safety and makes driving into a low sun, particularly on a winding road, much less distracting. While the surface of the outer visor matches the headlining when folded, its reverse side and both sides of the second visor are black to further reduce the anti-glare effects. 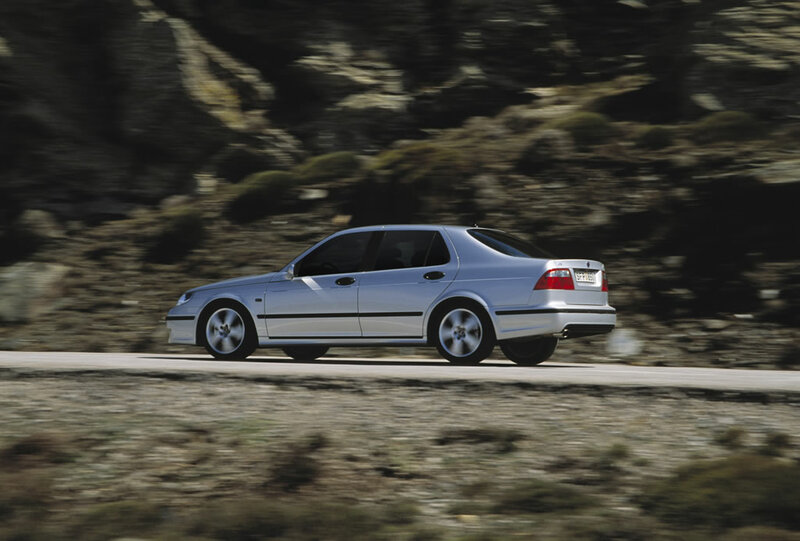 Saab introduced an innovative new concept in instrument displays when ‘Black Panel’ was launched on the Saab 900 in 1993, allowing the driver to turn off all supplementary information illumination at night, except for the speedometer. Any additional information important to the operation of the vehicle, such as very high engine revs or a low fuel level, appeared on a ‘need to know’ basis. 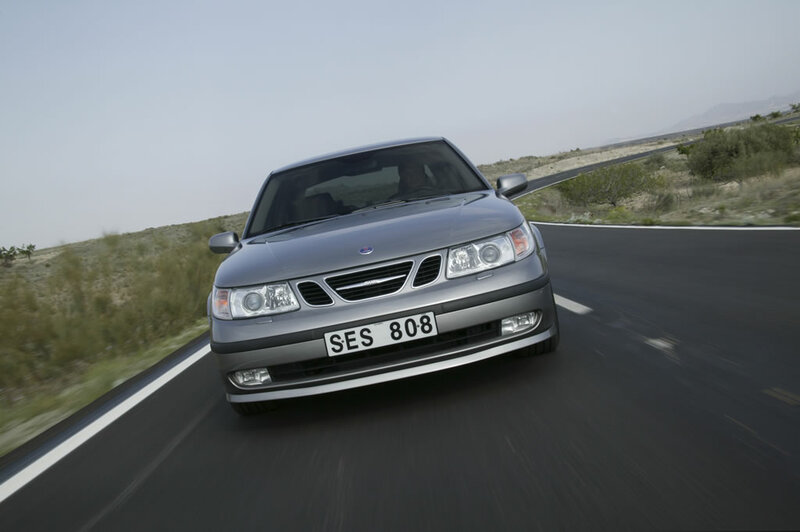 An enhanced version of this system, known as the Saab ‘Night Panel’ is a new feature for the Saab 9-5 and allows dimming of the instrument illumination, as well as blacking out. The 9-5 was the first car to offer the comfort of ventilated front seats. 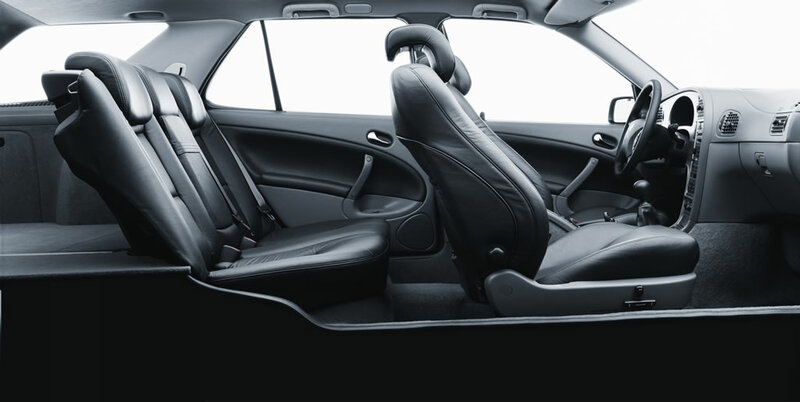 This feature ensures that cooling air is circulated between the occupant’s body and the surface of the seat he or she is sitting on, a function even the most powerful air conditioning systems cannot achieve. Two small electric fans, one in the seat squab and another in the backrest, draw air through small perforations in the leather trim, expelling it under the seat. Three-speed, thumbwheel controls are each located adjacent to those for the heated seats. The high speed sector of the speedometer (above 140 km/h) uses a compressed scale that is also switched off when the Night Panel function is activated. Compressing the scale in this way allows extra space for the sector of the dial which is read more frequently, increasing the accuracy with which the driver can determine the speed of the car. 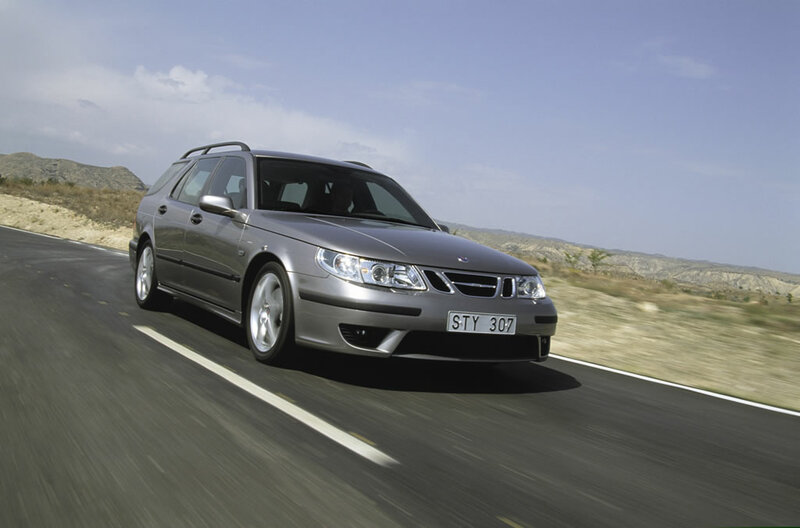 The Saab 9-5 was the first car to pass the Swedish Theft Protection Agency’s two-minute ‘attack’ and its state-of-the-art security systems are extremely effective in preventing theft of and from the car. The key can only be removed from its lock in the centre console after reverse gear with manual transmissions, or ‘park’ with an automatic transmission, has been selected. This effectively clamps the front wheels to prevent towing away. At the same time the engine is immobilised electronically to prevent it being started illegally. When the key is inserted into the lock on the centre console, the control unit in the security system must recognise the individual digital key code before it clears the immobiliser logic in the engine management system and allows the engine to start. Dead bolts in the doors, isolating the interior and exterior handles, are fitted as standard. To prevent tampering, all lock mechanisms are also encapsulated and sleeved cables, instead of rods, are used to connect the handles with the locks and latches, making it virtually impossible to interfere with the locking systems from outside. Lock cylinders are ‘freewheeling’ and designed to break away if forced, further improving security. The alarm system includes a glass break sensor, sensors for the door, hood and trunk lid and a tilt sensor which is triggered if either end of the car is hoisted on to a towing attachment. To deter any attempt to disconnect the siren, it is automatically activated if the connection between the siren and the ECU is interrupted.